We’ve discussed the Tetrarchy, Diocletian and his formation of the Tetrarchy, and his attempt to bring stability back to Rome and to the Empire, and how successful he was indeed. 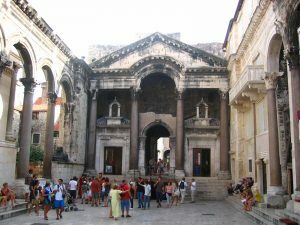 We also talked about the fact that Diocletian and the other Tetrarchs were responsible for some important building projects, in fact, bringing architecture back to Rome in a way that it had been missing in the third century A.D. And I mentioned in particular that Diocletian was interested both in public and in private architecture. And I remind you of an example of public architecture that we looked at last time, on the top left, the so-called Five Column Monument, or Decennial Monument, or Tetrachic Monument, that Diocletian erected in the Roman Forum to honor himself and to honor his formation of the Tetrarchy, and his relationship to Jupiter. 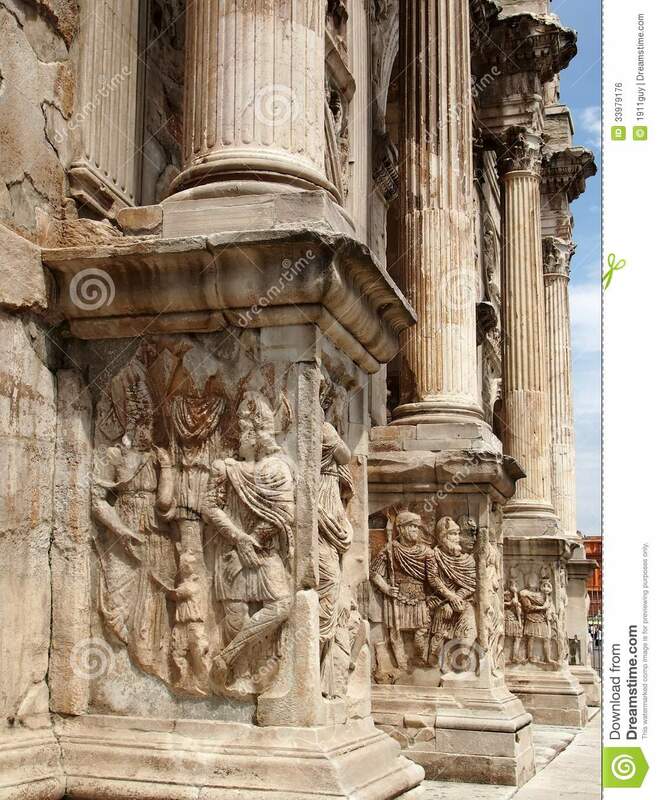 You’ll remember the five columns: four with the Tetrarchs imaged on the top in the front, the one of Jupiter behind, that this was located behind the Rostra or the speaker’s platform in the Roman Forum. 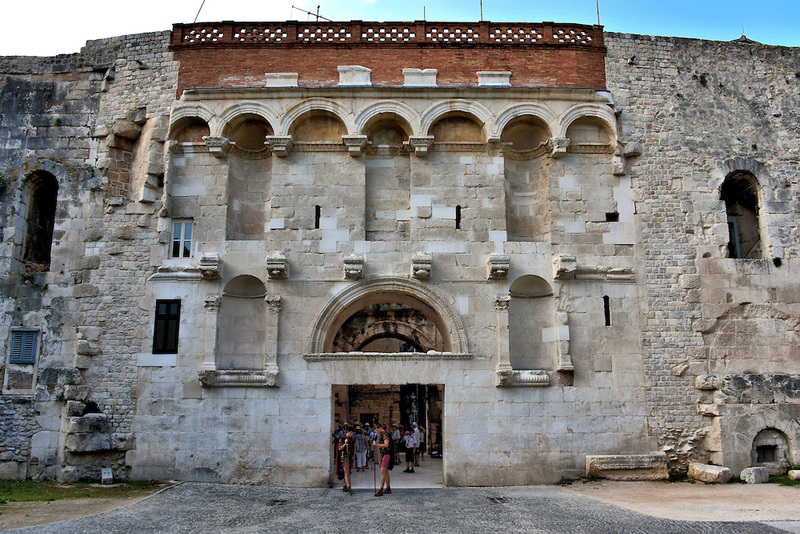 We also talked about the fact that Diocletian was interested again in private architecture, that he built a palace for himself, a place that he hoped to retire to, on the Dalmatian Coast where he was born, at a place called Split. And I remind you of it here, a restored view showing you what it looked like; that it was essentially a fortified camp, designed like a Roman castrum, with walls and towers and a very distinctive octagonal mausoleum that was located across from the Temple of Jupiter. So again his connecting himself to Jupiter, honoring Jupiter as he honors himself. And I also showed you an example of the portraiture of the Tetrarchs. We talked about the all-for-one-and-one-for-all philosophy, how they stuck together, not only in life but in their portraits, and they depicted themselves, or they had themselves depicted as this foursome, in large part again to underscore the fact that all four of them were co-equal emperors, that all four of them–or almost co-equal emperors: you’ll remember that there were Augusti and Caesars, so some had the slight upper hand, but for the most part they worked together. They’re represented as a whole, and they’re represented in a very similar way to one another. And we talked about the use of geometric forms, the abstraction, the solidity of these portraits that I suggested mirrors this new stability that Diocletian and the Tetrarchy have brought to Rome and to the Empire. And we saw that those same qualities, that interest in geometry, in abstraction, in solidity, were characteristic also of Tetrarchic architecture. And we’re going to see some of those features continuing on in the buildings that we’re going to be looking at today. Diocletian stepped down, retired voluntarily, on the first of May in 305 A.D. And Maximian, his co-Augustus, stepped down as well, and the two Caesars were elevated to Augusti, and two new Caesars were chosen. But without the strong presence of Diocletian the Tetrarchy fell apart, and Rome and the Empire were once again plunged into civil war. 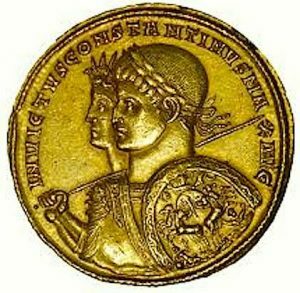 The two main claimants for imperial power that came out of this civil war were Maxentius–Maxentius who was the son of Maximian–and Constantine–Constantine who eventually became Constantine the Great–Constantine who was the son of Constantius Chlorus. And these two men, Constantine and Maxentius, warred with one another for imperial power, and they went against one another in one of the most famous battles of all time: in fact, a battle that is as well known, if not even more well known, than the Battle of Actium, and this is the Battle of the Milvian Bridge, the Battle of the Milvian Bridge which took place in 312 A.D.
And it was at that epic-making battle that Constantine was victorious over Maxentius, that Constantine became sole emperor of Rome — so a move away from the Tetrarchy and the placement of power in the hands of one man. Once again, Constantine becomes sole emperor of Rome. And it was at that same battle, the Battle of the Milvian Bridge–and one of the reasons that it’s such an important battle in historical terms is the fact that it was at that Battle of the Milvian Bridge that Constantine was said to have seen the vision of the cross; the vision of the cross that helped him to be victorious, the vision of the cross that eventually led him to convert to Christianity, which he did on his deathbed. He was baptized a Christian on his deathbed. One of the most interesting things that we’ll talk about today, and about the architecture under Constantine the Great, is that we will see, because he began as a pagan emperor and ended his life as a Christian emperor, he has in a sense one foot in the pagan past and the other foot in the Christian future, and we’re going to see that reflected in the architecture that he commissioned, as we look at that today. A few coins of Constantine which I think will help set the stage for this one foot in the past and one foot in the future, that is going to be the leitmotif of today’s lecture. I show you a coin of Constantine, when he first began his rise to power. It was probably struck in around 306 A.D. And it’s an interesting coin, because if you remember the coin of Diocletian that I showed you, you’ll recall that he was represented in a very similar fashion. It’s the sort of bearded blockhead style, as I call it, for the Tetrarchy; a very cubic image, a short, military hairstyle, closely cropped, and a short beard that adheres very closely to the shape of the face, and the face masked itself with cubic geometric forms. So we see Constantine in his very early portrait trying to look like a Tetrarch, trying to look like his father, Constantius Chlorus, trying to look like Diocletian, trying to fit in, before he figures out the way that’s going to enable him, in fact, to become emperor, sole emperor of Rome. After he defeats Maxentius, at the Battle of the Milvian Bridge, we see the greatest transformation in the history of Roman portraiture, in the history of self-imaging by emperors, by people in power, and that is this transformation that I can show you from this early coin of 306, to a coin that dates after the Battle of the Milvian Bridge, and that also represents Constantine. And what you see has happened here is Constantine has shaved off his beard, he has lost about twenty years of age, and he is shown with an entirely different hairstyle. Not the short military hairstyle that he wore because he wanted to liken himself to his father and to Diocletian, but an entirely new hairstyle, but one–for any of you who know your Roman portraiture or remember the portraits that I showed you fleetingly of Augustus and the Julio-Claudians–he is wearing a cap of hair that is very similar to–a fuller cap of hair, with comma-shaped locks over his forehead, growing long on the nape of his neck, that is characteristic of Augustus and also of Trajan. He’s in fact a neo-Augustus in this image, with a neo-Trajanic hairstyle. Why? Because he is–as sole emperor he has made the decision that he wants to now ally himself, not with the Tetrarchs, which are of the past at this point, but rather with the great emperors of the past: with Augustus, with Trajan, and as we’ll see also with Hadrian and with Marcus Aurelius. And we can see that very important break here, and we’ll see it also in architecture. Another coin down here representing Constantine, with a bunch of pagan regalia. We see him, as so many of the earlier emperors of Rome, depicted along with a patron god, in this case the god Helios, the god of the sun. And you can see Constantine in the foreground, Helios in the background: Helios represented with a rayed crown–and that’s why we know it’s him–silhouetted right behind the emperor. The emperor is shown as warlike, with military costume, a spear, and then a shield over here. And if we look closely at the shield we’ll see the depiction of someone in a chariot, led by four horses, coming–it’s represented frontally; it’s the solar chariot, the solar chariot of Helios. So a coin that is very much in the usual pagan tradition, where we see Constantine associating himself with the pagan past and with a pagan god, in this case Helios. This coin, however, that was also made after the Battle of the Milvian Bridge, shows us a very different Constantine. It’s an interesting frontal portrait, which is rare on Roman coins. He is still shown as the warrior. He’s in military costume. He’s holding the reins of his horse, who’s also depicted nicely in this portrait on this coin. If you look very closely at his shield, you will actually see that it still is decorated with a pagan symbol, with the she-wolf suckling Romulus and Remus. But look up here. The scepter that he carries is not the usual scepter or spear that we see in pagan imagery, but a cross scepter, a cross scepter and–I don’t know if you can see it from where you sit–he wears a medallion on the top of his very elaborate helmet, with plumage and so on, a medallion that has the Chi-Rho, which was the Christian monogram. So we see him in this image, not as the great pagan warrior, but as the new Christian crusader. So a very important change from paganism to Christianity, that as I mentioned already we will see also reflected in Constantine’s architecture. 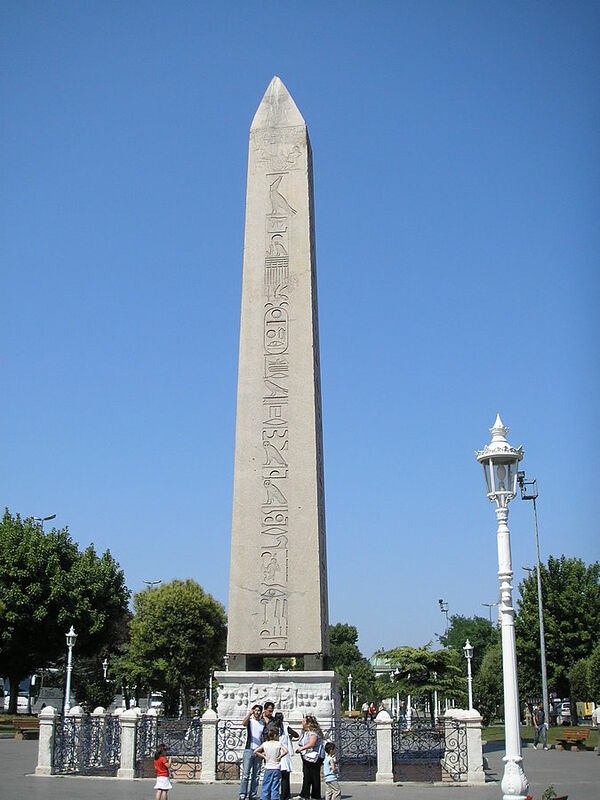 Constantine learned a lot though from the Tetrarchs, and one of the things that he continued on was to build great public architecture; public architecture for the benefit of the Roman populace at large. He follows the lead of Diocletian in this regard and adds another very large imperial bath to Rome; and I show you a plan of that imperial bath here. It bears his name, the Baths of Constantine, and dates to 320 A.D. It is located in Rome. It is located on the Quirinal Hill, the Quirinal Hill. And that should ring a bell for all of you, because you’ll remember it was Trajan–Trajan, and remember Constantine is imaging himself as a neo-Augustus with a neo-Trajanic hairstyle–Trajan who built–who had much, a good part of the Quirinal Hill cut back to make way for his forum, and then placed his markets on part of what remained of the Quirinal Hill. So the Quirinal Hill was associated in everybody’s mind with Trajan. 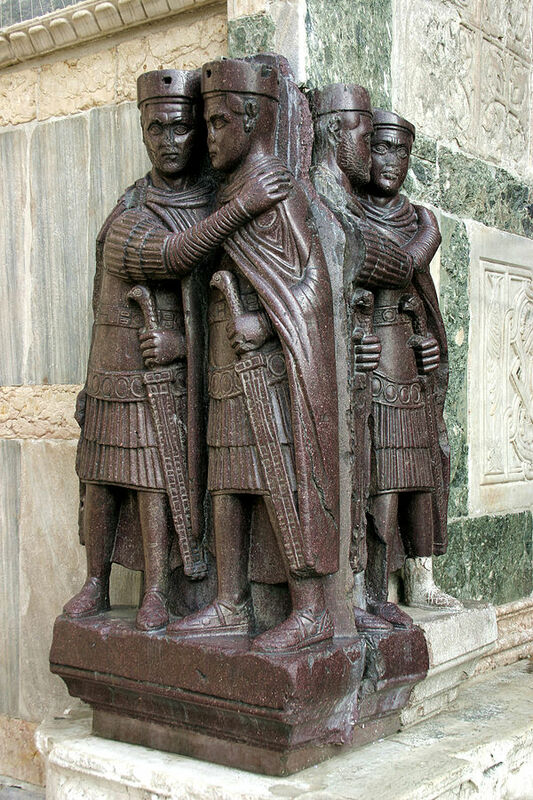 Constantine wanted to associate himself with Trajan. So when he decides where to place his new bath structure, he chooses the Quirinal Hill. This is not coincidental; it was very deliberative on his part. 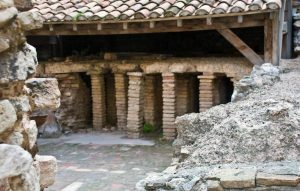 He builds it in a manner that is completely consistent with imperial bath architecture in Rome: the imperial bath type of architecture in Rome that we’ve already studied, from the time of Titus, up through the time of Diocletian. The baths on the Quirinal Hill are no longer preserved, but we fortunately have some drawings that were made by the famous architect Andrea Palladio, who drew it when it was in better shape, and his drawings of the Baths of Constantine allow us to see exactly what these baths were like in their heyday. 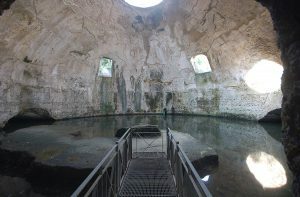 And we can see, although Palladio’s drawing concentrates on the bathing block, you can see that he also includes down here–and it’s probably that this is all that remained of this particular part of the bath in Palladio’s time–you can see he includes down here the great hemicycle that we’ve seen in so many of these baths, that are part of that precinct that surrounds the bath block. So this suggests to us, and I think very convincingly, that this bath, this bathing block, was also placed in one of these very large precincts that had all the seminar and lecture rooms and libraries around the perimeter of it, and that this was lined with seats and probably used for people to watch athletic contests, or perhaps even plays of other kinds. The bathing block again we can see conforms extremely well to the other baths that we’ve looked at, to the Baths of Caracalla and Diocletian, for example, with a natatio, rectangular in shape, with a frigidarium that is also rectangular and has three–a triple groin vault, as you can see designated in Palladio’s drawing, and down here–this is a re-interpretation, by the way, of Palladio’s drawing from Ward-Perkins, this plan that you see on the screen now. A tepidarium over here that’s somewhat more unusual in shape than we tend to see, where we have a series of lobes, four lobes in fact, that have been–that have expanded the space almost–well it’s sort of a circle, trying to become an oval, I suppose–but you can see the way in which they have expanded, and we call that kind of space quadrilobate, quadrilobate, and we see that here. And then we also see–this is most interesting — how the caldarium is treated. 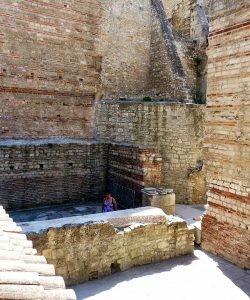 Because as you’ve seen in the baths that we’ve looked at, the imperial baths that we’ve looked at, if there’s any room that’s different in each of these it’s the caldarium. 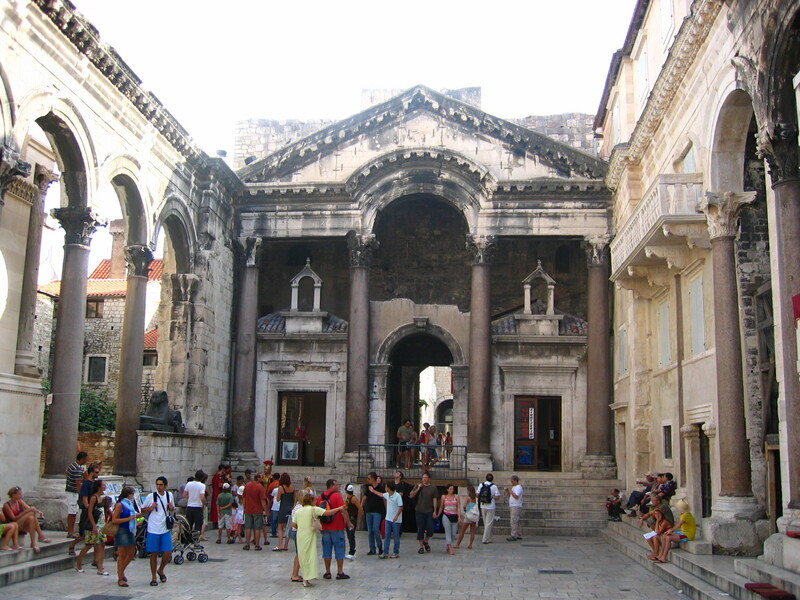 You’ll recall that Diocletian had moved to a rectangular caldarium, with radiating alcoves. But Constantine and his architects move back to the circular caldarium that we saw in the Baths of Caracalla, uses the same sort of scheme here, with three radiating alcoves, all of those screened from the outer space with columns, and the rest of the structure, around these main rooms of the bathing block that are related to one another, axially we see the other rooms symmetrically disposed. 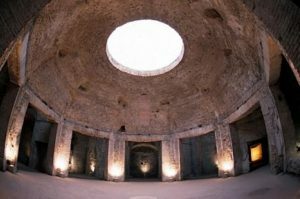 One other important point to make about the caldarium is that we see that it too corresponds to a development that we’ve already begun to see in some of the other buildings that we looked at, especially in the last lecture, and that is this move away from the oculus for round-domed buildings. 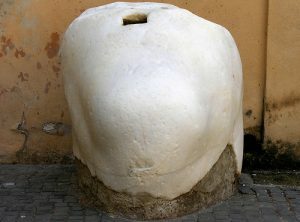 This round–this caldarium does not have an oculus, as so many caldaria did in the past; think back to the–well or so many bathing rooms did–think back to the frigidaria in Pompeii, for example, with their oculus. The oculus is no longer used here, and instead we see windows in the base of the dome that are very similar to the windows that we saw in a couple of Tetrarchic buildings. We’re going to see it elsewhere today, and I’ll reiterate that point then. 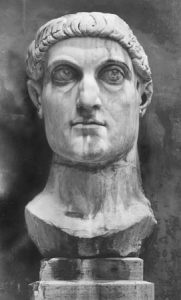 Constantine, like so many Roman emperors before him, did complete buildings that had been begun by his predecessors, and he did this for some of the Tetrarchs, including his father, not surprisingly, Constantius Chlorus. We know that Constantius Chlorus had chosen as his capital the city of Trier, the city of Trier, in what was Gaul but now is Germany. And I show you the location of Trier above. 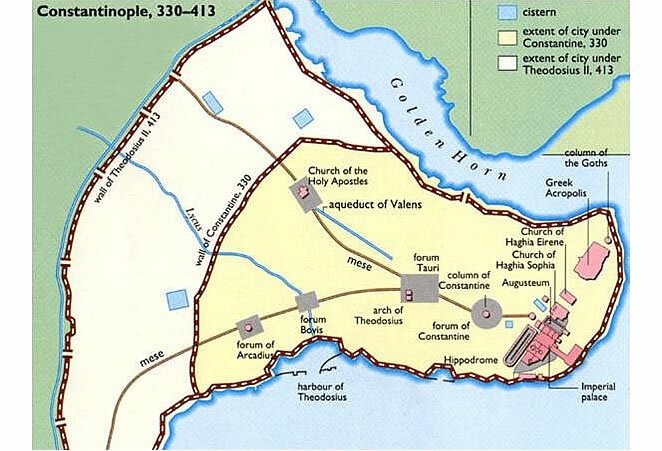 This was the chosen capital for Constantius Chlorus. 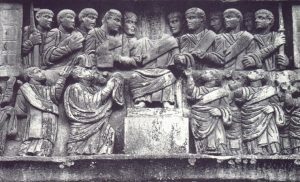 Even before Constantius Chlorus began to build a palace for himself at Trier, as the other Tetrarchs had done elsewhere in the Roman provinces, there was quite a bit of building activity going on with regard to one project in Trier, in the third century, and not surprisingly that too was a defensive wall. That part of the Empire was being attacked on a regular basis by Germanic tribes, by the Franks and by the Alemanni, were coming in, wreaking havoc in that part of the world, and a decision was taken, not surprisingly, in 275 and 276–because you’ll remember that’s exactly when the Aurelian Walls were dedicated in Rome, 275–to build a major wall in this part of the Empire as well. And we have some part of that wall still preserved, especially a gate in that wall called the Porta Nigra, which I show you here on the right-hand side of the screen. 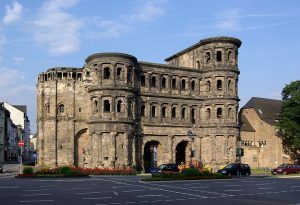 The Porta Nigra which, although the walls were begun in the 270s–so the walls date primarily in the third century–this particular gate was not added to the walls until the early fourth century A.D., during the time of Constantius Chlorus, and Constantine completes this gateway and those walls. If we compare the gate at the Porta Nigra in Trier to the gate that we looked at from the Aurelian Walls, the so-called Porta Appia that does date to around 275–and you see it again in this restored view from Ward-Perkins, on the left-hand side of the screen–you will see the close resemblance of the Porta Nigra to the Porta Maggiore in Rome. 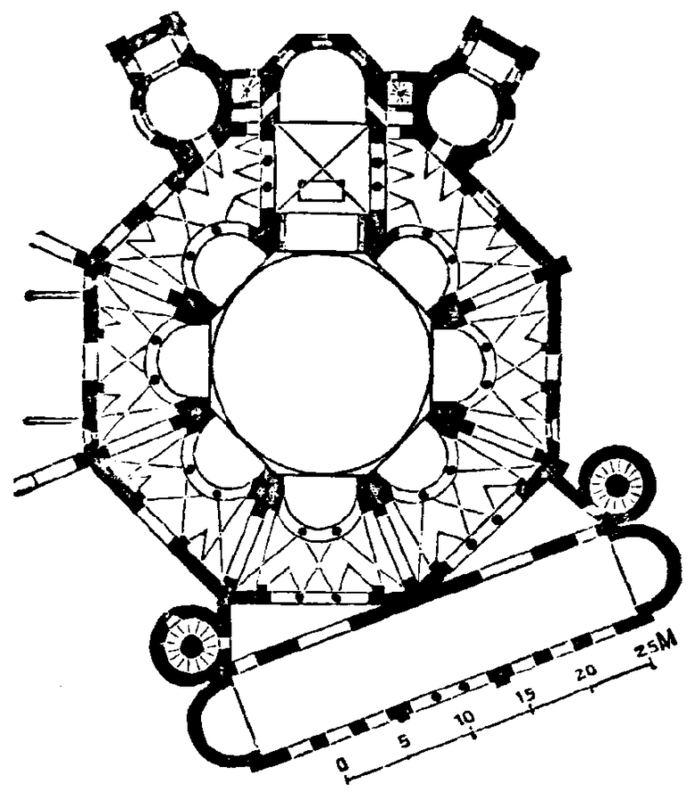 By that I mean both of them have two arcuated entranceways; both of them have round towers, as you can see here; both of them have arcuated windows or blind windows, as you can see; in the case of the Porta Nigra they have columns between them, which is not the case in the Porta Appia. 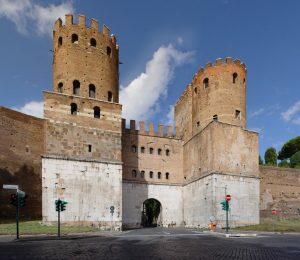 The main difference between these two is that the Porta Appia in Rome you’ll recall was made out of concrete faced with brick, the most contemporary building material, whereas you can clearly see by looking at the Porta Nigra that the Porta Nigra is made out of stone, out of cut stone construction — extremely old-fashioned at this particular time. But I think it is very likely that they wanted, by choosing this for this particular part of the world–and it is–this cut stone construction is local stone–by choosing this, they wanted to reassert a relationship between the early fourth century A.D. and earlier Rome, and especially earlier Rome and imperial power, the very symbols of Roman power, buildings like the Theater of Marcellus, and especially the Colosseum in Rome; we’ve talked about that as the very icon of Rome, its ability to impress and to awe. And I think they wanted to take advantage of that kind of awe inspiring rhetoric, you know, visual rhetoric that such a choice could make. And I think it’s an example of the fact, just as Constantine reaches back to emperors like Trajan and Augustus, to associate himself with in his portraiture, I think that they had reason to look back to some of the great buildings of the Roman past, and to use that kind of visual imagery to reassert that Rome, despite the fact that they were being attacked by barbarians, all was well in Rome, or continued to be well in the capital, as well as on the frontiers, and this kind of image I think worked in that regard. Well one hopes that–well they thought it would work at any rate in that regard, even into the early fourth century A.D. 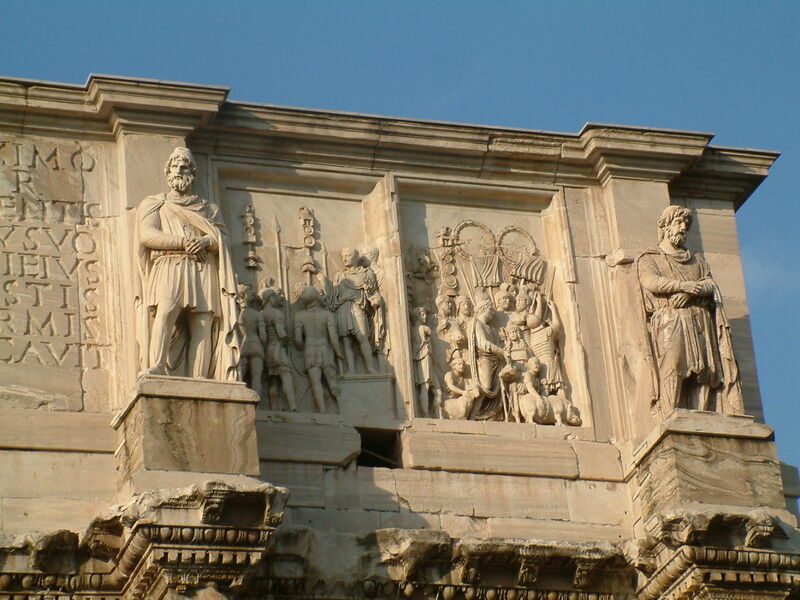 I compare the Porta Nigra also to a detail from the Porta Maggiore in Rome, which you’ll recall was built by Claudius. 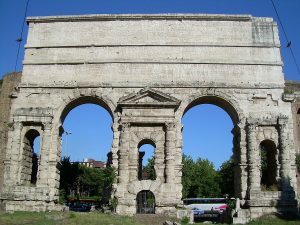 There is an interesting resemblance between the two, and many scholars have called attention to that, because the stone of the Porta Nigra is not as smoothed over as the stone of the Colosseum or the Theater of Marcellus; it’s left in a much more rough state, a rough state that reminds one of the rusticated masonry of Claudius’ Porta Maggiore. 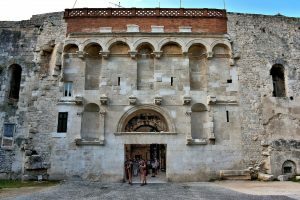 But remember that in the case of the Porta Maggiore, there was a deliberate disjunction between the rusticated masonry and the finished masonry; the finished capitals and also the finished pediments above. And we talked about the fact that we believe that that has a lot to do with the particular personality and antiquarian interests of Claudius, who liked the intellectual exercise and idea of playing off one against the other. We don’t see that same combination here. We don’t see the rough and the finished, in the case of the Porta Nigra in Trier. And it has been suggested, and I think correctly so, that the reason that the Porta Nigra looks the way it does is not deliberate, the way the Porta Maggiore is, but rather because it really was unfinished; the blocks were never fully smoothed over. But it makes a very attractive appearance even still today, despite that. So Constantine completed this gateway, but he also completed the palace that had been begun by his father; Constantius Chlorus had begun a palace in Trier. The palace had a very large and impressive bath building, as a piece of it, and it also had this building that is usually referred to today as the Aula Palatina or the Basilica — the Aula Palatina or the Basilica. 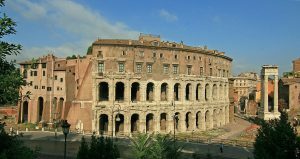 We’re not exactly sure how it was used in the palace, but possibly in the same way that the basilica was in the Palace of Domitian on the Palatine Hill, as a place where he could sit and try cases himself. It may have been used in the same fashion here. It’s extremely well preserved. 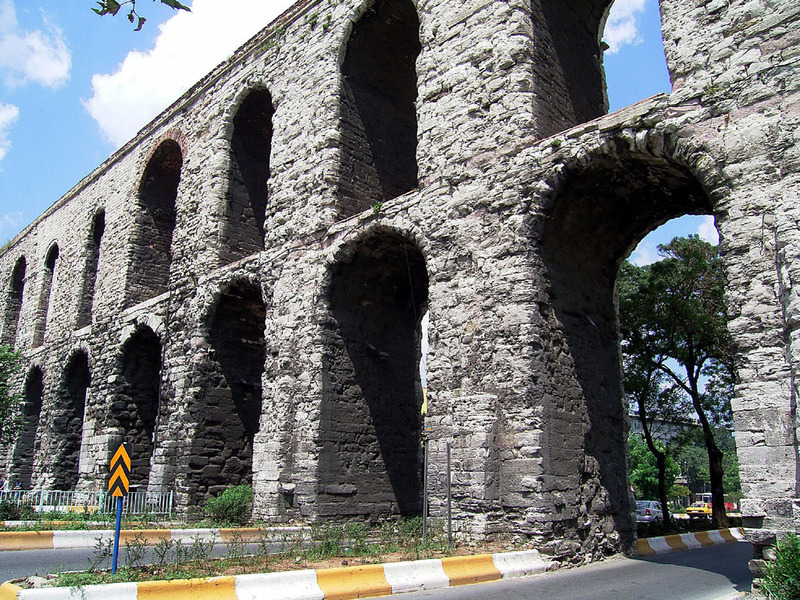 It dates to 300 to 310 A.D.; again, part of the Palace of Constantius Chlorus, completed by Constantine. We see a plan and a restored view from Ward-Perkins now on the screen. 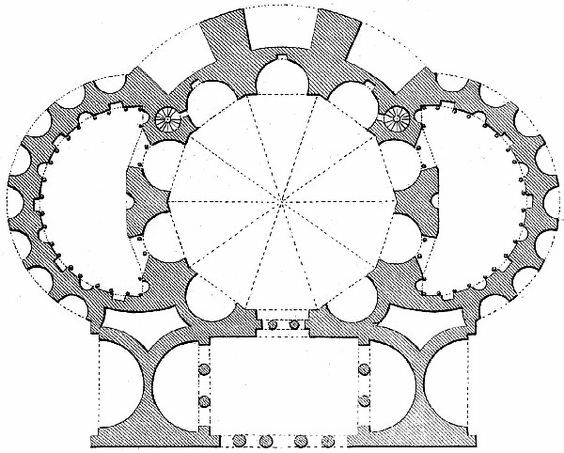 And if you look at the plan, you will see that in the main it follows the basilican plan that we’ve become so accustomed to: a great open rectangular space with an apse on one end, and with all attention drawn toward that apse. So in that sense again, one foot in the pagan past; it looks back to basilicas of an earlier date, be they the one in Domitian’s Palace or the Forum of Trajan in Rome. But there are some differences here. 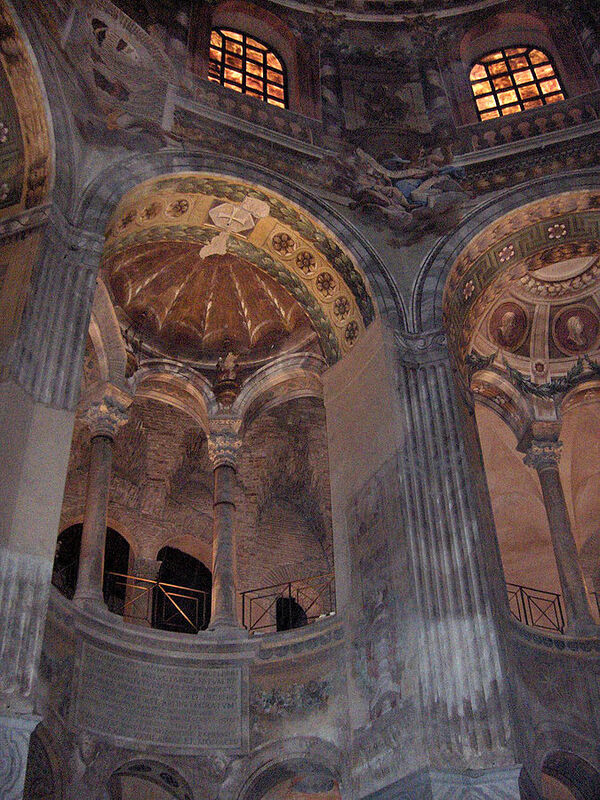 One of them is the fact that you can see that there are no columns inside the cella. 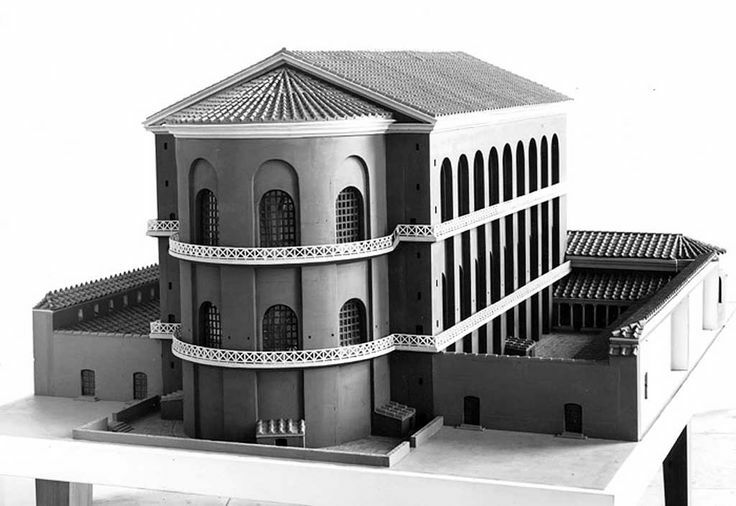 That’s interesting, and it is in keeping with the Tetrarchic aesthetic that we’ve already described, for the Curia, for example, with a box-like open space inside, without any columnar decoration at all. No columns in here; stark, geometric, abstract in the Tetrachic manner. But they have placed columns on the outside of the Basilica, in a kind of courtyard on either side, columns that you can see here, which is a very interesting and unusual and in fact unique approach. 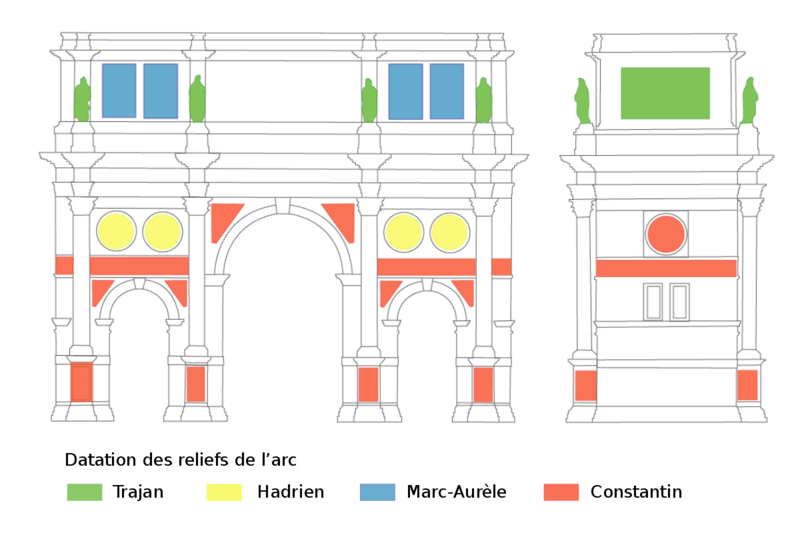 You can also see there is a transverse corridor over here, and that–a transverse–a vestibule, a transverse vestibule, entrance vestibule, which is unusual and which we don’t see in typical Roman basilican architecture. We call that a narthex, and this addition of the narthex here, the transverse vestibule, is interesting because it is going to become the basis for most church architecture, both from the time–basilican church architecture–in the time of Constantine, because Constantine does found Old–does build Old St. Peter’s and other churches in Rome, and others follow suit. So again, one foot in the pagan past, one in the Christian future. The building is made out of solid brick and has arched windows. The round topped windows which we have seen have become customary for Tetrarchic architecture, as well as the very interesting use of projecting elements, that are very simple — they look almost like pilasters, but they’re not pilasters, they’re a simplified, abstract version of pilasters. So this paring down of the elements that is so consistent with the Tetrarchic ethos. 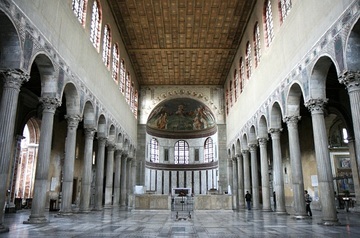 Here’s a view of the Aula Palatina as it looks today. Again, it is extremely well preserved, as you can see, but it no longer has its outer courtyard and it no longer has its railings. But the rest is there. You can see these wonderful round-headed windows and how large they are. We’ve talked about the ability of architects to dematerialize the wall at this point in time, and the way in which they have opened it up with very large windows. And you can see what I was describing just before, these molded elements that project out into our space. They kind of look like they’re made to conjure up pilasters, but they don’t have any capitals and they don’t have any bases; they’re, in my mind, a kind of abstract version of a pilaster. And they’re very effective, I think, in terms of the aesthetic appeal of this particular building. 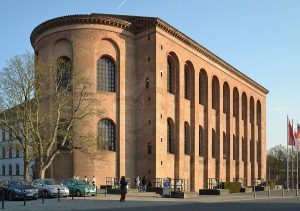 While the Basilica at the Palace at Trier, the Palace of Constantius Chlorus at Trier, is so clearly based on earlier Roman basilican architecture, it looks to the future. And if we look around Rome in the years following the construction of buildings like the Aula Palatina, we see lots of early churches. 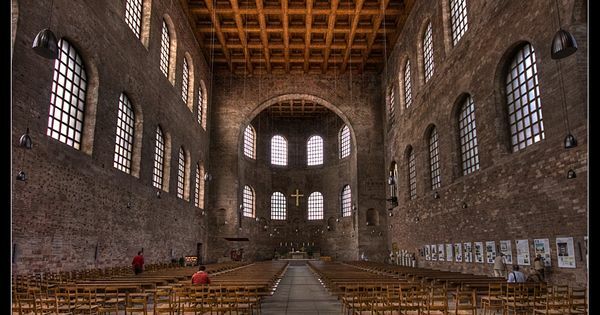 I show you the Church of Santa Sabina in Rome, which dates to 425 A.D., so the fifth century A.D. And I think you can see how similar it is to the Aula Palatina: the basilican form; the apse at the end; the very large round-topped windows that we see in the Basilica at Trier. 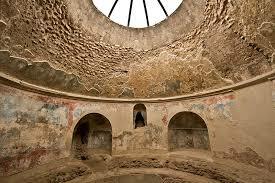 The interior of the Aula Palatina is also very well preserved. You see a view of it here. It has been transformed, not surprisingly, into a church in later times. It’s a perfect space for that. And I think it’s well worth comparing it to the interior of the Curia that we looked at last time, because again it shows a vision of the Tetrarchy — a vision that is consistent from Rome to the provinces; this whole idea of paring things down to their basics, of creating a box-like shape, no columnar architecture whatsoever, a very sparsely decorated rectangular space with a flat ceiling and with round-headed windows. We see the same concept here. Here they’ve placed the round-headed windows on two stories, which has opened the building up even more and allowed light to flow into it; no columnar decoration whatsoever. The scheme of two rows of round-headed windows, in the niche as well, also opening it up, dematerializing it, allowing light to stream into the building in what is a very spiritual way, and again not at all surprising that it would be transformed in later times into a church. Once again one foot in the pagan past, one in the Christian future. 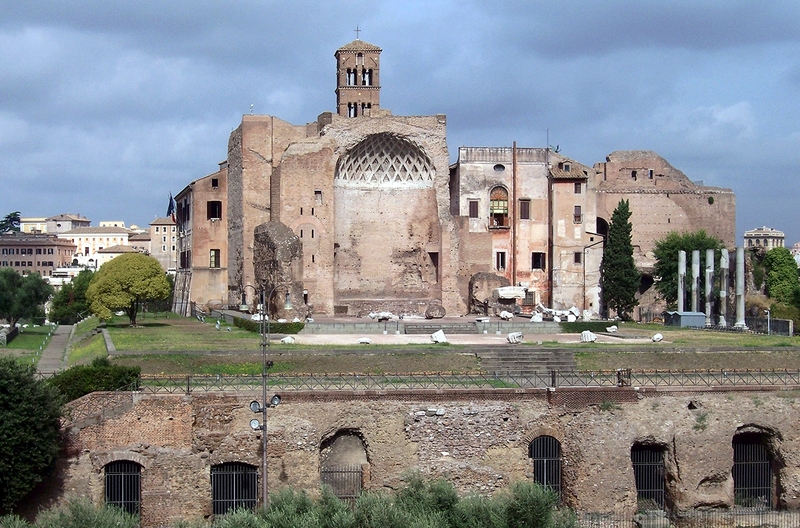 I show you a restored view of the Basilica Ulpia in Rome, part of the Forum of Trajan. 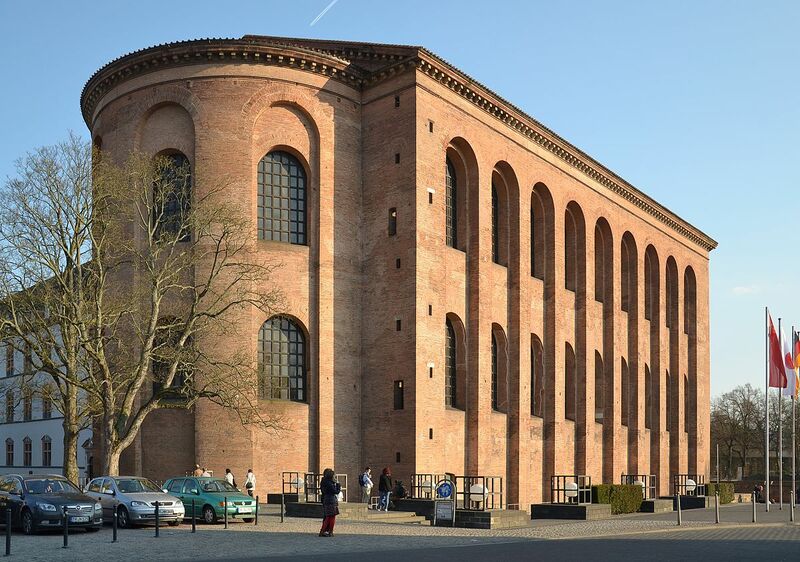 It’s that kind of thing, that kind of basilican plan that lies behind the design of the Basilica at the Palace of Constantius Chlorus in Trier. But it also looks forward to others. 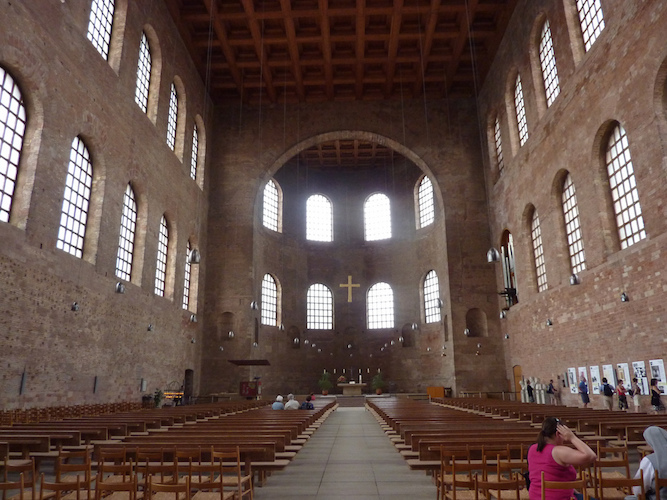 I show you here the interior of Santa Sabina. This might not have been the best to choose, because you can see the columns have been reintroduced in the interior of Santa Sabina. But if you think those columns away and just look at the way in which the apse is designed, with the round-headed windows, the same round-headed windows in the upper story up here, I think that you can see how much it owes to buildings like the Aula Palatina. 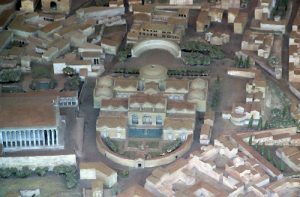 The round dome building type, just like the basilican type, was to be very important in the Constantinian period, and also in later times. I show you the frigidarium at the Stabian Baths of Pompeii; at the Temple of Mercury from the spa at Baia, the so-called Temple of Mercury; the octagonal room of Nero’s Domus Aurea; and the dome of the Pantheon here on the far right. There is no more important form in Roman architecture than the domed room, very characteristic of the Romans, and a special gift that they passed on to posterity, as you well know. And this type of building continued to be explored in the Constantinian period. 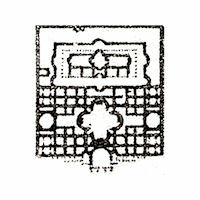 This is the plan of the so-called “Temple of Minerva Medica” in Rome. It’s not a temple at all. 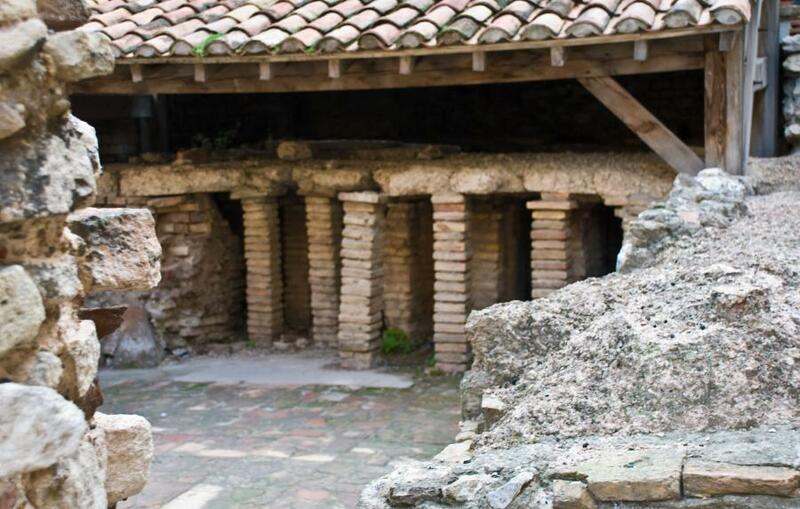 It dates to the early fourth century A.D. It’s not a temple, but what it was, was a pavilion in a garden. We know that an emperor of the third century A.D. by the name of Gallienus, was responsible for building some imperial gardens in the third century A.D. — so this was another project that did happen in the third century A.D., the building of some imperial gardens for the enjoyment of the emperors and of the imperial family. And it was in these gardens that were created in the third century that this pavilion was added, during the Constantinian period, in the early fourth century A.D. This pavilion in the so-called Licinian Gardens, as commissioned by Gallienus, the Licinian Gardens. And we see it above. 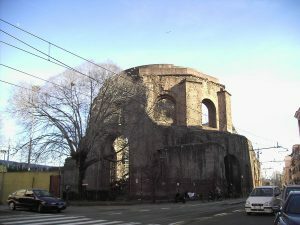 And it’s very interesting because although it clearly–it’s a building made out of concrete, faced with brick–and although it clearly is based on some of the buildings that I just showed you– the typical round structure with oculus, the frigidaria, the spa, the octagonal room, and the Pantheon–you can see that the architects of this period were still able to innovate, and have gone further by creating not a round building, although at first it looks round, or an octagonal building, but a decagonal building, a ten-sided building. And you can see ten–you can see radiating apses, nine, and then the entranceway over here. So ten-sided structure. 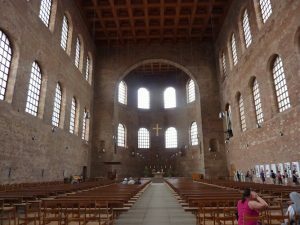 If you look very carefully at the plan you will notice though that the uppermost apse, the one that is located directly across from the entranceway, is a tiny bit larger than the others. So that gives the building a little bit–even though it’s a round building–a little bit of a longitudinal axis, which is very interesting — this incorporation of a longitudinal axis into a round structure. You can also see the way in which the radiating apses, the two on either side, left and right, are screened by columns, in a way that we’ve also become accustomed to. And I believe that those columns, yes I’m pretty sure, that those columns have a triple arcuation up above. 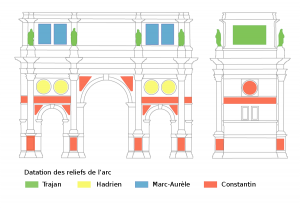 So that–yes, you can see that in plan–a triple arcuation above that we’ve seen also is characteristic of late Roman architecture, not only in the private sphere, as this is, but also in the more public sphere. But going back to that longitudinal axis, look also at the entrance vestibule. This is another one of these narthexes, this cross–this transverse vestibule, in this case with apses on either end, that is characteristic of these early fourth-century A.D. Roman, pagan Roman buildings, but is going to become a hallmark of Christian architecture, not only basilican architecture, that is churches in the form of basilicas, but small religious structures that are circular in general plan. So a very interesting plan in that regard, and a very innovative plan in the early fourth century A.D. The building is still preserved. It was made out of concrete, faced with brick, as I mentioned before. We are looking at the interior, up toward the dome. 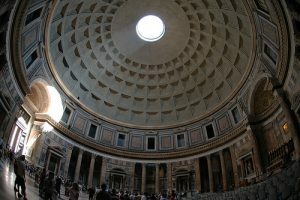 You can see something very interesting here, which is the addition of ribbed–of bricks to create ribs in the dome, to give it something of a sense of a segmented dome, which is a building technique that we see sometimes in late Roman architecture. And you can also see–although it looks like it has an oculus, that’s just because most of the roof has fallen in; it did not have an oculus. Instead the lighting was provided through these round-headed windows that we see, very large round-headed windows at the base of the dome. So again this move away, in late antiquity, from the oculus to using these very large round-headed windows to light the interior of the building. And this is a view of the so-called Temple of Minerva Medica as it looks today, from the outside, where you can see those same round-headed buildings [correction: windows], where you can see those same sort of piers, that are not so different from the ones that we saw at Trier, used rather than columns to decorate the structure. A large round-headed doorway down here. You can see the scale–this is a pretty big pavilion in a garden–you can see its scale in relationship to the cars that surround it. 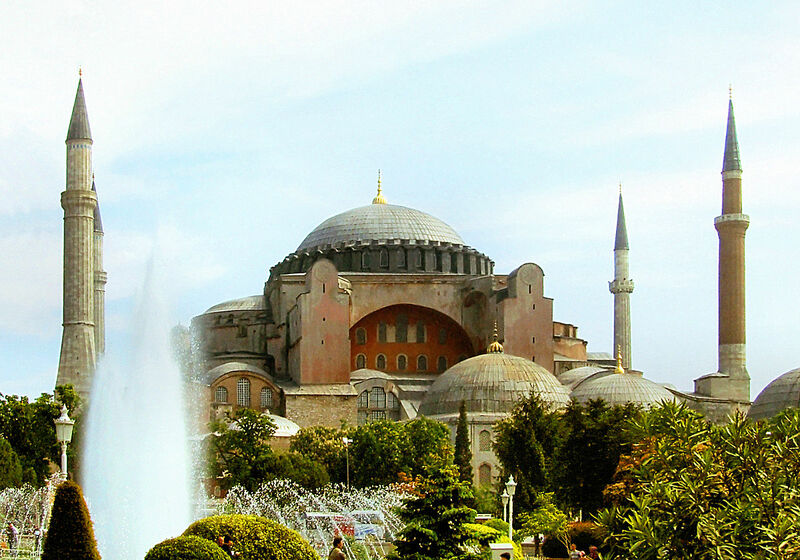 So continued innovation in round architecture under Constantine the Great, and a building type that is going to have a long history in the Medieval period, in the Byzantine period, and well beyond. I show you just one example of the impact that it had on later church architecture. This is the Church of San Vitale, a very famous church in Ravenna, in Italy, that honors Justinian, the famous Justinian, and Theodora. It was built in the sixth century A.D. And I think you can see by looking at a view of the exterior plan, and also a view of the interior, how important architectural experiments under the Romans were for buildings like this: the massing of the outside; the geometry, the interest in geometry; simple forms; round-headed windows. So similar to the aesthetic that we saw in the Curia or in the Basilica at Trier. 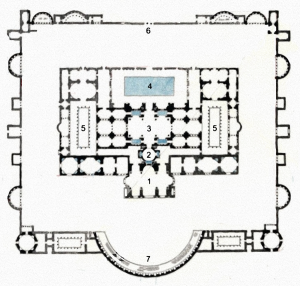 The plan above, in this case an octagon with a central area, with radiating alcoves; very similar to the sorts of things that we see, not just in the Domus Aurea, but also in the Temple of Minerva Medica. 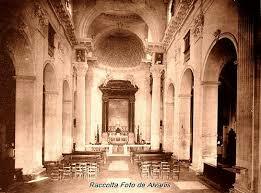 And you can see the narthex here, just as we saw it in the Temple of Minerva Medica. And you can see in this view of the interior, for example, the triple arches on top of the two columns — all of these motifs taken over clearly from Roman architecture, ancient Roman architecture, and exploited in the Medieval and Byzantine periods. The single most important building that I am going to show you today is the one that I want to turn to now. 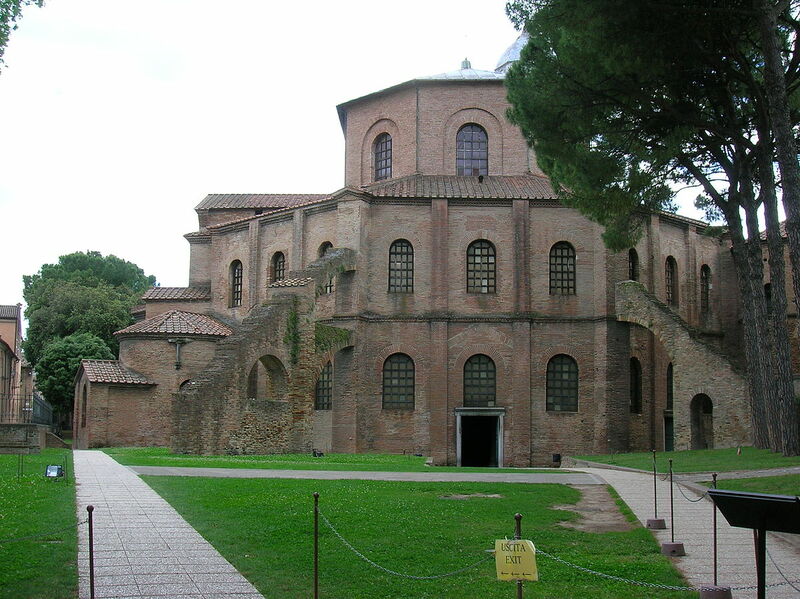 And this is the so-called Basilica Nova, or the Basilica of Maxentius-Constantine. I can’t over-emphasize the significance of this incredible building. 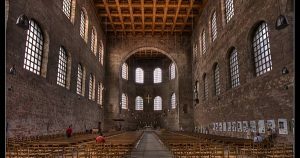 It is a building that demonstrates to us that Constantine not only completed commissions that had been begun by his father, such as the palace at Trier and the Porta Nigra, but also by other Tetrarchs, and in this case by his rival, Maxentius. 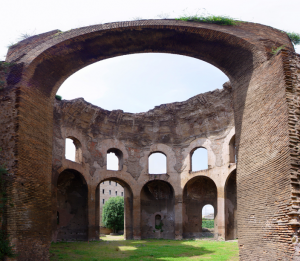 We know that this building was begun by Maxentius, which is why it is sometimes referred to as the Basilica of Maxentius-Constantine, or more easily the Basilica Nova. It was begun by Maxentius in 306 A.D. When Constantine was victorious over Maxentius at the Battle of the Milvian Bridge, he took it over and he completed it in his own name: so hence the Basilica of Maxentius-Constantine, or again more easily the Basilica Nova. 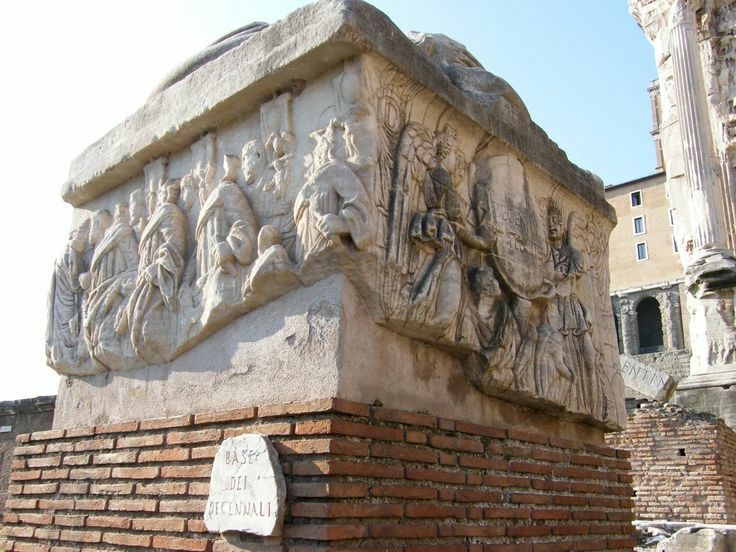 The area that was built up by Diocletian, or one of the areas, was the area where we see the Curia, which was restored by Diocletian, and also the Five Column Monument, closest to the Capitoline Hill. But Maxentius was particularly interested in the area, the uppermost area, closer to the Colosseum. If you look right under the Colosseum, you can see the remains of the Temple of Venus and Roma that was the Greek import that Hadrian built and may have designed himself in Rome. And it was that at the time that the building burned down in a fire; remember that fire of 283 that destroyed the Curia also destroyed part of the Temple of Venus and Roma, and it was rebuilt by Maxentius, by Maxentius, by the Tetrarch Maxentius. 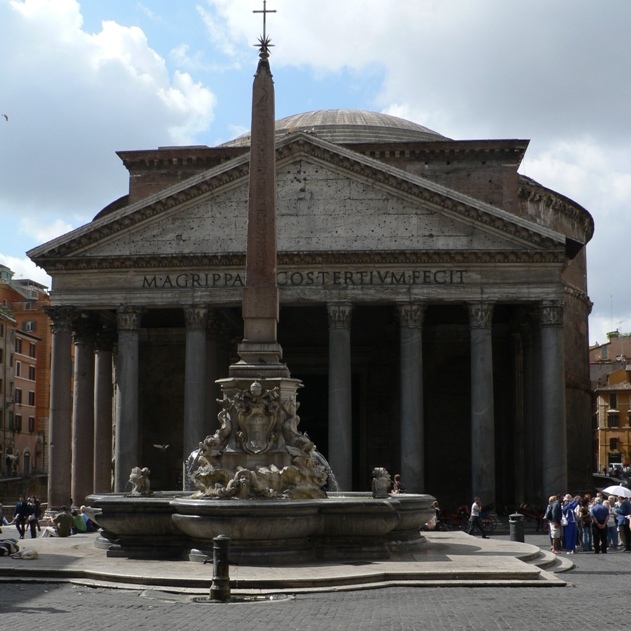 He rebuilt the Temple of Venus and Roma, and you’ll recall the niche that is well preserved with his rebuilding. 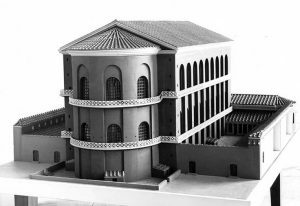 So it’s not surprising to see him choosing the location right next door, right underneath the Temple of Venus and Roma for his Basilica Nova in Rome, when it begins to be built. And it still is preserved on that site today. I show you a panorama that includes the Basilica Nova, and you can see how very large a building it is. And there are only essentially three barrel vaults, a small part of the building, still preserved. But it gives you a sense of its scale, when you compare it to some of the other structures here. But you can see many that we’ve studied. You can see the Temple of Antoninus and Faustina. You can see the Arch of Septimius Severus. You can see the Curia. 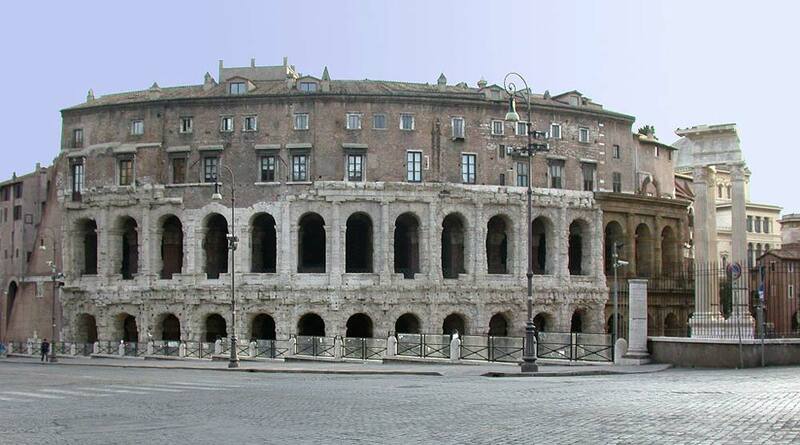 You can see the Tabularium, and the Michelangelo palazzo that was built into that. You can see the Victor Emmanuel Monument. And you can see the Arch of Titus, the remains of the Temple of Venus and Roma, and so on. So a very large building in the midst of an area that Maxentius was particularly interested in restoring. Here’s a view of the Basilica Nova as it looks today. It’s taken from the side, the other side, with one’s back to the Palatine Hill. And we can see here that it is a building made out of brick–out of concrete, excuse me, faced with brick. We can see that the artists are better than ever at dematerializing–the architects and designers–better than ever at dematerializing the wall. They have used very large, round-headed windows here, on two stories. There’s more window than there’s wall. That’s how good they’ve become at manipulating the brick-faced concrete medium–you see it in this wall over here as well. And you see these three giant barrel vaults, with soaring vaults — a very impressive work of architecture. Let me show you a restored view of what the Basilica Nova would have looked like in its heyday, and then let me say a little bit more about what happens when Constantine takes over construction of this particular building. This restored view is very, very interesting because it shows us that although this building was used, without question, as a basilica–that was its purpose, a basilica–we see here that it is unlike any basilica that we have seen in the course of this semester. And I wonder as you look at this whether you can tell me if it’s not–it’s not built like a customary basilica; it doesn’t look like the Basilica Ulpia in Rome. It doesn’t look like the basilica at Trier. But it does look like what other kind of building, that we’ve seen time and again in the course of this semester? Look at the vaulting, look at the barrel vaults on either side. Look at the shape of the windows in the upper tier. Look at the shape of the exterior of the building that is created by the choice of vaulting. What does this look like? If not a basilica? Someone said a market. Yes which–yes, who said bath structure? That’s the answer. Which part of a typical Roman imperial bath does this look like? 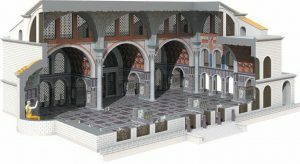 The frigidarium; the frigidarium, the frigidarium, the great large rectangular space, with a triple groin vaulted roof, with windows that are usually divided into three parts, on the uppermost part, and then buttressed by great barrel vaulted chambers. 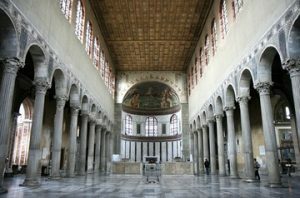 This is a basilica that is built in the form of a frigidarium. That’s an awfully creative thing to do. 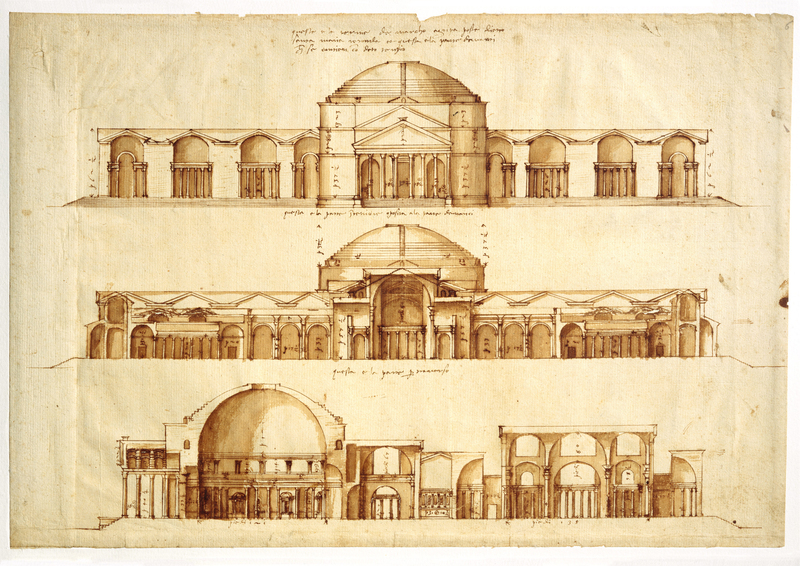 It shows us once again this interest in the interchangeability of form; that you can take a plan that was used for one kind of building and use it for another, as they have done so effectively here, using a frigidarium plan for a basilica, and capitalizing on that, to make it work in this environment as well. So some very creative minds I think at work in the time of Maxentius and in the time of Constantine. 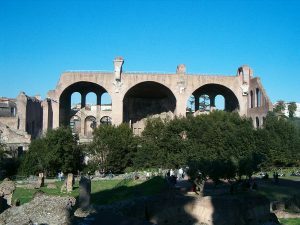 When the building was first designed for Maxentius, the idea was to have the entranceway on the eastern part of the building–the eastern part of the building, the part of the building that faces the Colosseum–and to enter into it that way, and to have the main apse be over here, on the western end of the structure, to give it a longitudinal focus, and the kind of focus one would have seen in a typical frigidarium, as well as in a typical basilica. Constantine comes in, takes it over, and decides he wants to change the orientation. He wants the entranceway not to be closest to the Colosseum, but rather to the Roman Forum, and to the Sacred Way, and to the Velia, which is the part on which this was built, to the Arch of Titus. 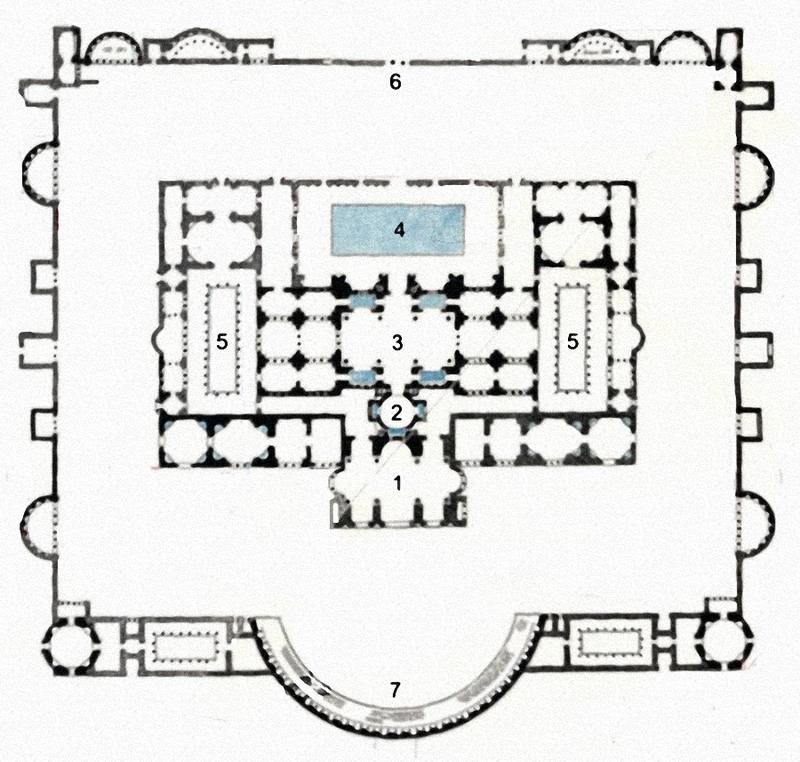 And he instructs his architects to change the orientation from an east-west orientation to a north-south orientation, and to place the entranceway on the Forum side, on the south. 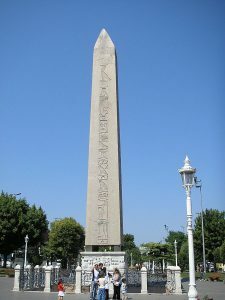 He also instructs them to put four columns here, and these columns are made out of porphyry, that purplish stone that’s quarried in Egypt and that was used so extensively for Tetrarchic art, Tetrachic portraiture; we see that here. 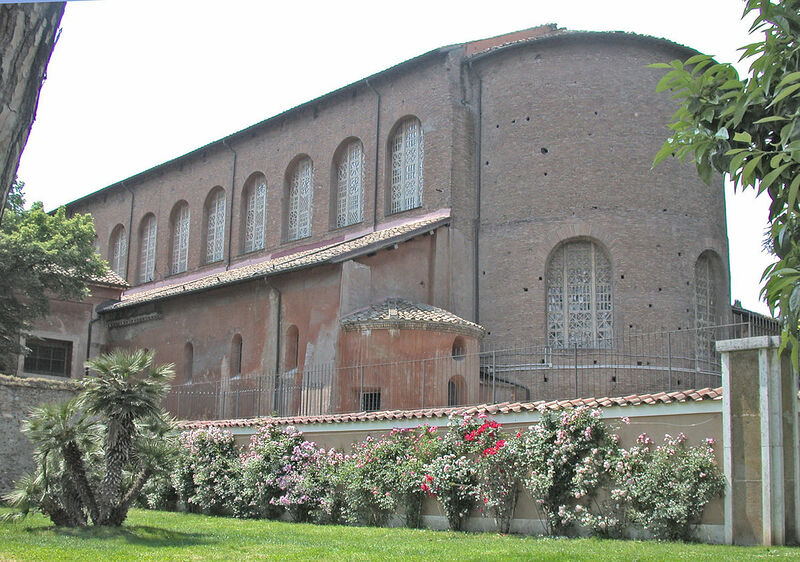 Then he’s very tempted to change the orientation of the niche; instead of to put his portrait, as Maxentius–Maxentius intended to put his portrait in this–his own portrait, that is, of Maxentius–in this apse. Constantine was probably tempted to put his own portrait in this apse over here, on the northern side, so that it would be the first thing that you saw when you came in. 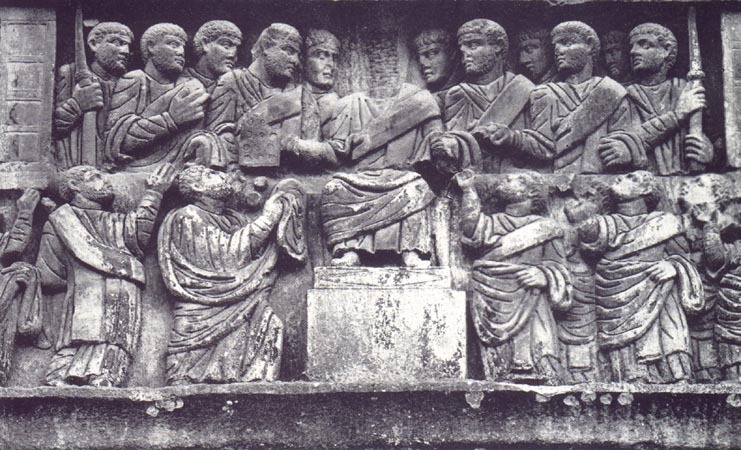 But he resisted that temptation and decided to leave–or to place a seated portrait of himself in this niche, leave it where Maxentius intended it. So you would have to enter the building and take an abrupt left to see that statue. But we think–we’re not absolutely sure–we think he may also have put another statue of himself, in this case a standing statue, in this niche. 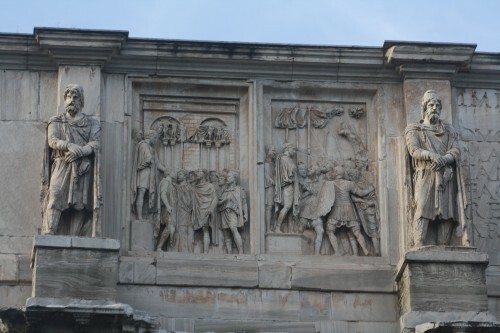 But as we’ll see, there are lots of niches in the wall of the northern end, and we think that there were statues of all of his lieutenants; the lieutenants that had helped him win his great battle at the Milvian Bridge, that were located in this niche. And so he may have been shown there, surrounded by his most worthy and his most loyal lieutenants. And then another statue of him seated in the niche over here. So we see him–again the most important thing is he shifts the orientation. Another restored view, which perhaps–in color–which perhaps gives you a better sense of the majesty of this particular building, in its time. 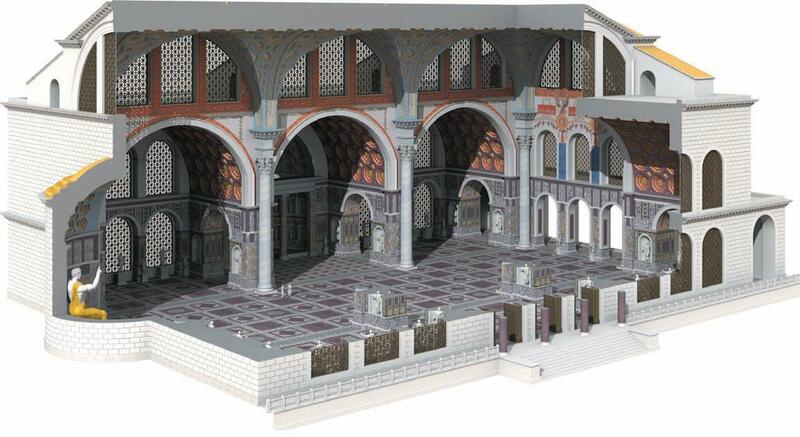 The entrance, the Constantinian entranceway, through the porphyry columns, through the doorways, into the main body of the structure — the same kind of marble pavements with maroon and green and white, that we’ve seen in so many other buildings, used here, marble revetment on the wall. You can get a sense of the groin vaults and the way in which they were probably also decorated, either with painting and stucco, or maybe even mosaic. The great coffered ceilings of the barrel vaults. And look at the way in which they’ve created a lateral entrance, arched entranceways, in each of these piers, to create a greater flow of space, just as you would see in a typical frigidarium. And then again this opening up, this very impressive opening up of the walls, with these exceedingly large round-headed windows that allow again light to stream into the structure. 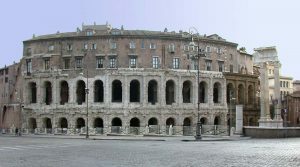 A real tour de force of Roman architecture; in my opinion, one of the greatest buildings ever built by Roman architects. Believe it or not, we have the portrait of Constantine still preserved, or least bits and pieces of it — a fairly significant number of bits and pieces, including the head, which I show you here, which is now on view in the courtyard of the Conservatori Palace, one of the palaces on the Capitoline Hill that belongs to the Capitoline Museums. 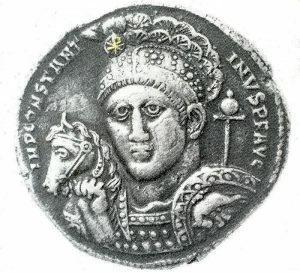 We see Constantine here, and you can see how similar he is to that transformed portrait that showed him as a neo-Augustus with a neo-Trajanic hairstyle: beardless, very clean shaven, very large eyes, but very much in the mode of the earlier emperors, Augustus and Trajan, rather than in the mode of the Tetrarchs. And yet a very abstract, geometric image, very much in keeping with Tetrarchic and Constantinian art, in that regard, and truly colossal in scale. 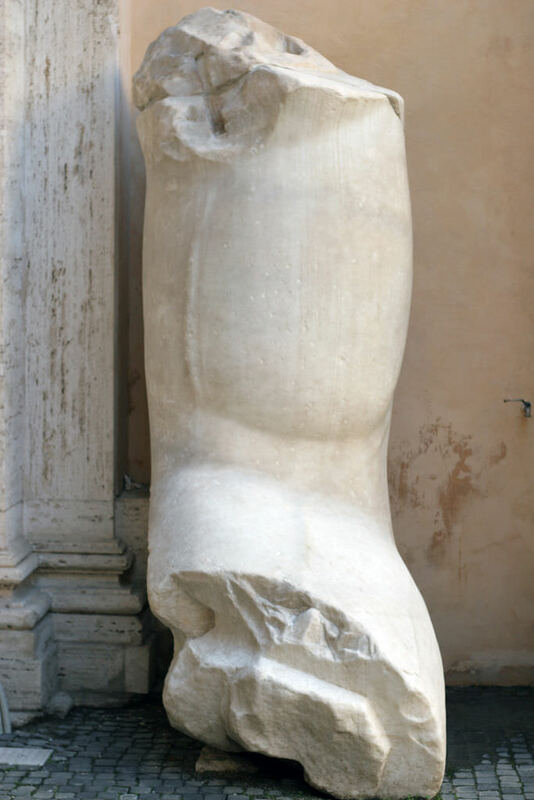 We have a lot of the body parts that are also preserved in that same courtyard, from this same statue, including the shin of the leg, from the knee down, the knee itself, and the way in which the knee is depicted tells us that the knee was bent, and that consequently this did indeed come from a seated statue of Constantine, that statue that would have been in that left-hand niche. 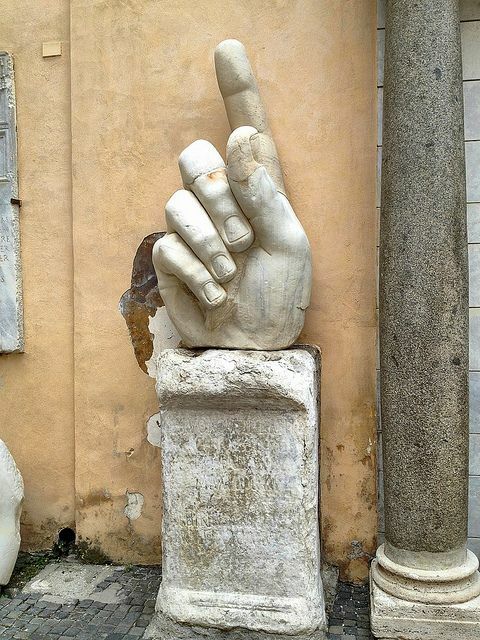 We also see the famous hand from the statue, as well as part of an arm. And the arm is very impressive, because if you look at it carefully you will see that the musculature is very clearly delineated, and you can even see the veins of the arm showing through the skin, which shows you how adept artists still were during this time period. These are right out in the courtyard of the Conservatori Palace. Everybody–there’s no tourist, with a camera, who goes by here without taking a photograph in front of it; including yours truly. I’ve done that. I’m absolutely incapable–it’s hard to say it–I’m totally incapable of going into this piazza and not taking a picture, either of whomever I’m with, or them of me, and I have tons of these from years and years of posing in front of this. It’s a pretty good Mediterranean tan, I must say, on this side. But posing with these hands and feet and so on. 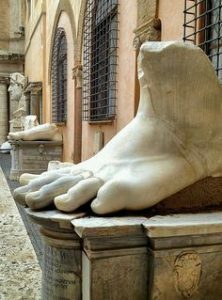 At any rate, if you put all of those pieces together–and there are actually two feet preserved, two feet; the shin; the knee; part of the chest, which we also have; that arm that I showed you, the hand, the infamous hand; and the head of Constantine. This is what you get: a seated statue, thirty feet tall–you’ve got a big building, you need a big statue–thirty feet tall, that sat in the main niche, that niche to the left as you entered into the Basilica of Maxentius-Constantine from the Roman Forum. 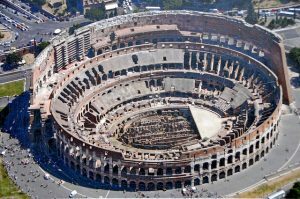 There are scholars who argue that Roman architecture declined in late antiquity; and not only architecture but painting and sculpture as well. And one could make an argument, I believe, that Roman painting and sculpture did decline. I’m not saying I necessarily agree that they did, because art can sometimes change for reasons that have to do with trying to articulate a different message than you’ve tried to articulate before, and a new style may be more appropriate for that than the style that you’ve been using up to that point. So I think it’s a very complex matter when you think about whether art declines or not. But without saying whether I believe that Roman sculpture or painting declines, I want to say categorically that I do not believe that Roman architecture declines. And I think a building like this is a case in point. This, in my opinion, is again one of the greatest buildings. If you compare this to the Colosseum, if you compare this even to the sacred Pantheon, if you compare this to some of the bath buildings that we’ve talked about, as impressive as they are, I think this takes its place, the Basilica Nova takes its place among the most impressive works of architecture that were left to us by the Romans. And I think you can see what I mean, just by looking at this image. Because to still be able to create these kinds of soaring vaults out of concrete, to face them with brick, to create windows that are large enough to essentially dematerialize the wall–and the building still stands, and still stands today–the soaring vaults, those soaring rib vaults, or groin vaults, that we see in the center of this space, to do that at this kind of scale is an incredible architectural feat. I don’t think there’s any way that one can say that architecture declines during this period, when one looks at a building like this. And also keep in mind how creative they’ve been, that at this point in time they’ve decided to create a basilica in the form of a frigidarium, from a typical imperial bath. That’s a very creative thing to do, and I think it couldn’t have happened were it not that architects–that creative juices were not continuing to flow for architects and artisans working on major projects like these in the time of Constantine the Great. 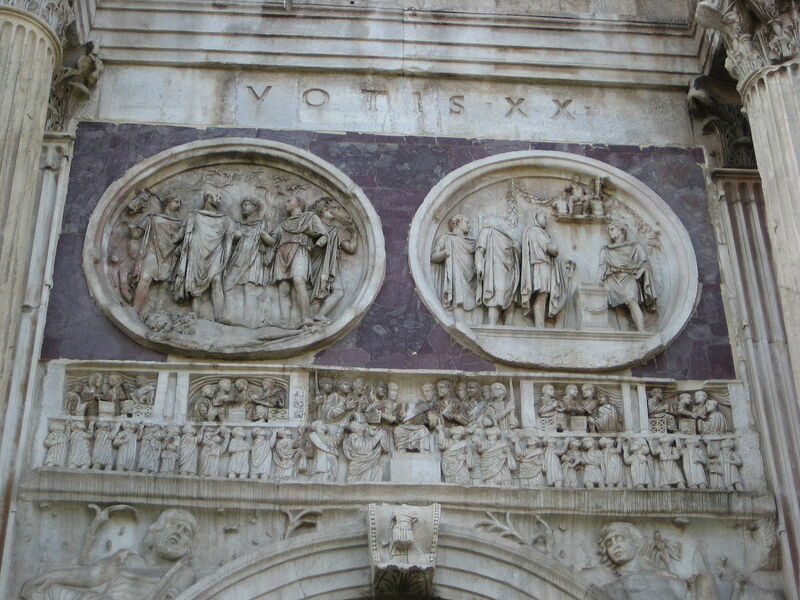 I want to turn from the Basilica Nova to the Arch of Constantine. 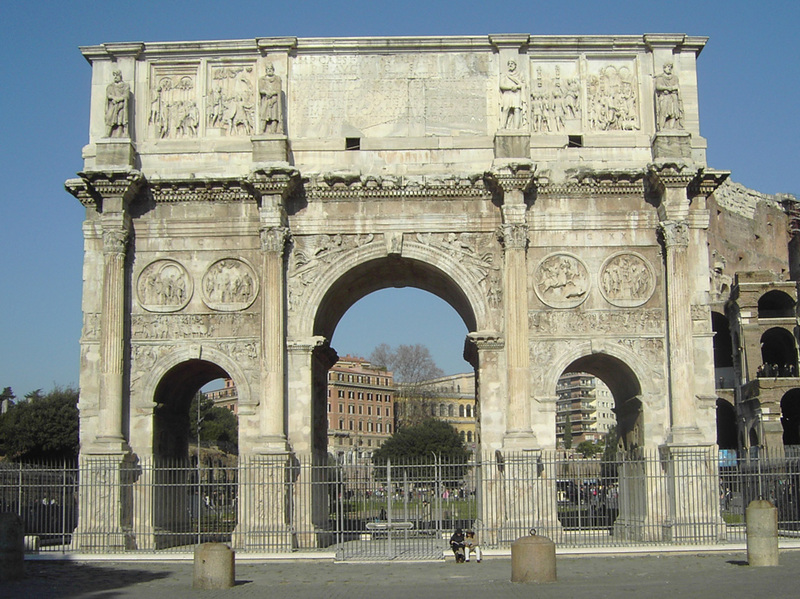 The Arch of Constantine was constructed by Constantine to celebrate his victory over Maxentius at the Battle of the Milvian Bridge. We think it was begun in 312 A.D. and completed in 315 A.D. 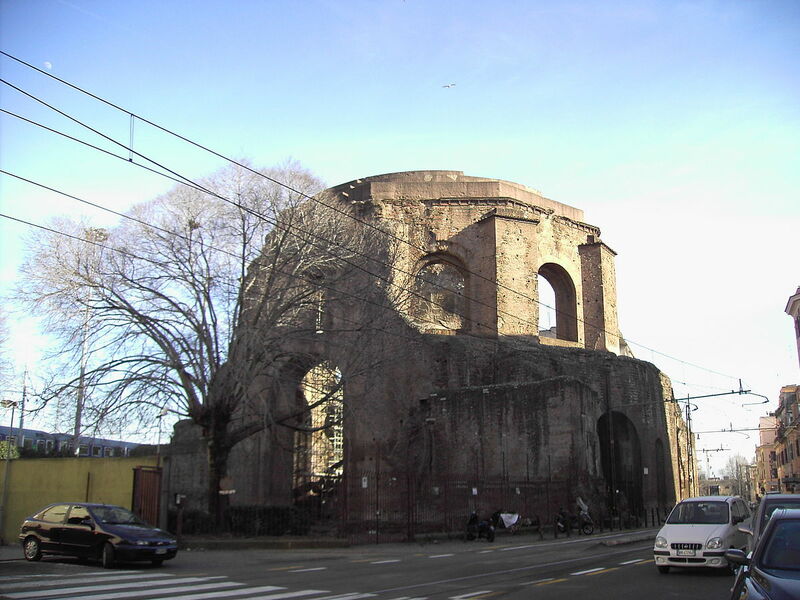 It is also possible, some scholars have suggested that it’s conceivable, that Maxentius may have begun this too, in the same way that he began the Basilica Nova, and that Constantine took it over when he was victorious over Maxentius at the Battle of the Milvian Bridge. We don’t know which is the case, whether it was begun by Maxentius and finished by Constantine, or whether Constantine began it himself. I’m more likely to favor the latter, that Constantine began it himself. But we do not know, and it’s something that you should be aware of, that particular controversy. But it certainly dates to this time period, to roughly between 312 and 315 A.D. One of the reasons that we believe–I mean, one of the reasons, the incontrovertible reason that we know that the building was completed by Constantine is the inscription tells us it’s a Constantinian building, but also there are friezes here that depict the Battle of the Milvian Bridge, and other battles from that war, and show us, of course, Constantine victorious in those scenes. 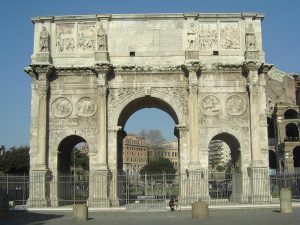 It is a triple-bayed arch, very similar in that regard to the Arch of Septimius Severus in the Roman Forum, and I don’t think there’s any question that the general format of it is based on the Arch of Septimius Severus, in the Roman Forum. 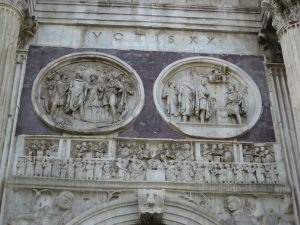 It too, like the Arch of Septimius Severus, is covered with sculpture, a veritable billboard advertising the achievements of Constantine in this important battle, and overall. 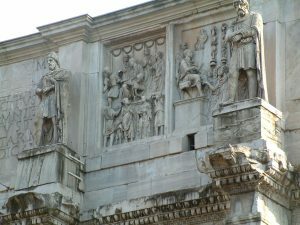 But we see that of course instead of the panels, the excerpts as I described them, from the Columns of Trajan or Marcus Aurelius that we see on the Arch of Septimius Severus, we see a very different kind of sculptural decoration here. 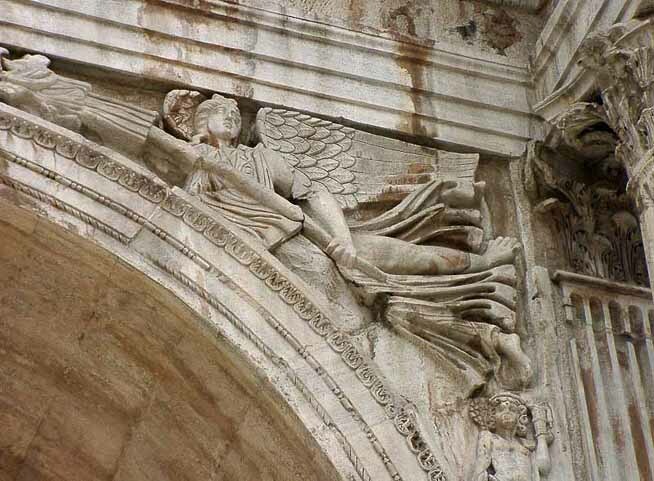 It does cover the entire arch, and it’s interesting primarily because some of it is Constantinian. 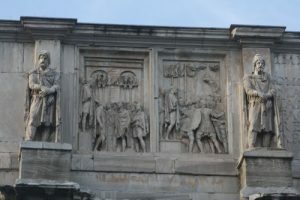 The parts that are Constantinian, that were carved during the fourth century, are the spandrels with the victories; the spandrels with the river gods, very much like the Arch of Trajan at Benevento; the frieze that encircles all sides of the monument, you can see that frieze here; the pedestals of the columns were also carved in the Constantinian period; and there are two roundels, two round frames, on either short side of the Constantinian monument that were also done during the Constantinian period. But what’s particularly interesting is the fact that all the rest of the sculpture was cobbled together from earlier monuments. And it won’t surprise you to hear that they were the monuments of the emperor Trajan, the emperor Hadrian, and the emperor Marcus Aurelius — all the men whom Constantine considered the great emperors of the second century A.D., the emperors of the second century A.D. with whom he most wanted to connect himself. He inserts sculpture from their monuments into this monument. We don’t know whether these were monuments that had fallen into disrepair and were lying in shambles around the city, or whether he actually deliberately took apart earlier monuments to extract from them the fragments that he wanted. Also very interesting is the fact that in all of these scenes, the scenes that are used from earlier monuments, he replaces the heads of Trajan, Hadrian and Marcus Aurelius with his own portrait. So he in a sense becomes them in this arch. Also above is a diagram, which will give you perhaps a better sense of all of this. The Trajanic, the material from the Trajanic period includes statues of Dacians that come from the Forum of Trajan in Rome, as well as from two panels–four panels in fact; two that are located on the central bay, on either side, and two that are located on the sides on the attic, in both cases. Hadrian, the roundels, eight of them on the two long sides of the arch, belong to some lost hunting monument of Hadrian. 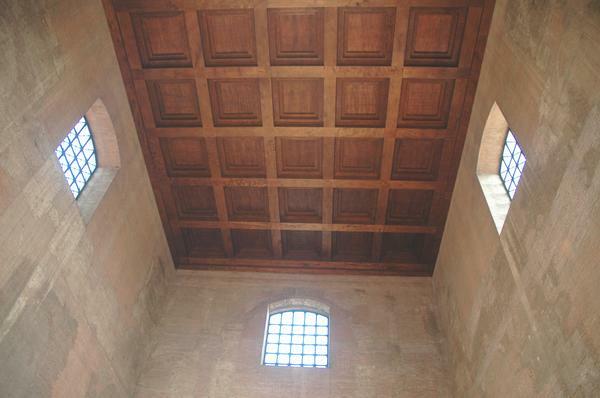 The panels, the vertical panels that you see in the attic, come from an arch, a lost Arch of Marcus Aurelius. 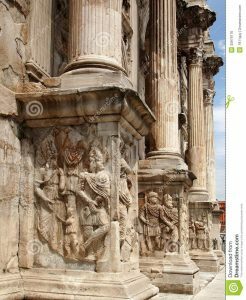 And, as I’ve already described, the bases, the spandrels, and the frieze all belong to the Constantinian period. A panel on the left-hand side from the Forum of Trajan, representing Trajan returning to Rome after his victory over the Dacians. We think this was a pedestal, or a base, a podium, for the Temple of Divine Trajan that was at the end of the forum and built by Hadrian. We see a couple of the Dacians that come from the Forum of Trajan, the second story, in the main part of the forum. And then these vertical panels that we believe come from a lost Arch of Marcus Aurelius. Here we see part of the Constantinian frieze, with Constantine seated, now headless, in the center. Here we see the roundels from a lost hunting monument, we believe, of Hadrian. You can see a dead lion, for example, lying here. Hadrian has returned from the hunt, but the head of Hadrian re-carved as a head of Constantine. Another scene over here: a sacrifice to Hercules, who is floating in the uppermost part above. 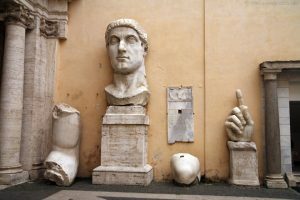 But again the main thing for us is just that this comes from–a Hadrianic monument is reused here so that Constantine can associate himself with these great emperors of the fourth century [correction: second century]. 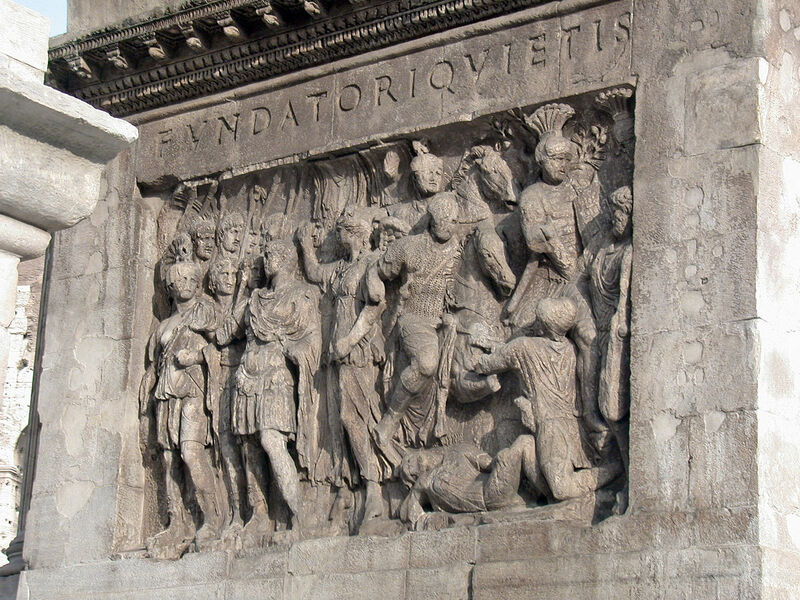 Another detail showing you the Dacians, from the Forum of Trajan, as well as these panels from this lost Arch of Marcus Aurelius, probably originally dating to the 170s to 180 A.D.
What you see here are the spandrels, with victories, and a victory in the base; victories triumphant over a barbarian, who kneels at her feet. And if you look at these scenes, if you look at these very carefully and you compare them to the little bit of Roman sculpture that we’ve looked at in the course of this semester–think of the Ara Pacis, for example–when you think back to that and you look at these figures, one could agree with the contention that this is not as good as it once was. If you look at this figure of the doughy season–the boy who’s representing a season down here, or this figure of the victory, who is not depicted with the same finesse that we see the victory writing on the shield on the Column of Trajan, I think a case can be made that this is not as well rendered as it was once upon a time. You can see that in the river god; and you can definitely see it in this scene here. This is a scene from the Constantinian frieze, depicting the siege of the city of Verona, very similar to that siege scene we saw in the Column of Trajan with the battering ram. And I think you can see, as you look at these figures, they are much more awkward in their motions. Look at these three over here, with the shields and the spears. They are exactly the same as if they were stamped out of a cookie cutter. You don’t see the artist taking the time to create distinction between them, as you would see on the south frieze, for example, of the Ara Pacis. Again there may be–there’s a different–they had different thoughts behind this of what they’re trying to achieve, and it may be that this different style works better for what they’ve been trying to achieve. We’ve talked about this move toward abstraction and toward geometry and so on. So it’s not that I’m talking about this in a denigrating way. I’m saying that it could be chosen for a different reason to–it helps them present their case in a better way. But I don’t–I think it’s undeniable that it isn’t as fine in quality as what we saw before. 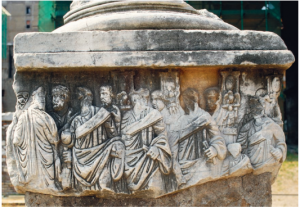 And we see here this scene of Constantine on the Rostra in the Roman Forum addressing the people. He’s got the Five Column Monument behind him. But look at these statues on either side; seated statues. 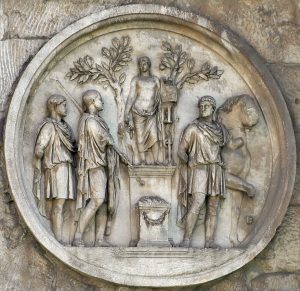 We can identify them by their portraits of Hadrian and of Marcus Aurelius, which I think demonstrates without any question–the head of Constantine is gone, but he would have been represented with his neo-Trajanic hairstyle, in the center, flanked by Marcus Aurelius and by Hadrian. 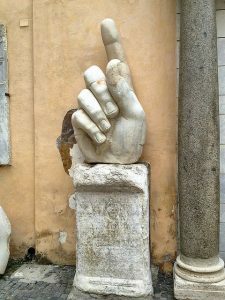 I think that suggests without question again that he is deliberately–that he has taken these bits and pieces of sculpture from other monuments in order to underscore his relationship to these great leaders of the pagan past. And I want to quote from Bernard Berenson, the great art historian, in a book that he wrote called The Arch of Constantine, or the Decline of Form, in 1954. And I quote him as we look at the above detail from the Constantinian frieze: “These stunted bodies are swathed in heavy blankets, or covered with scanty shifts, both with the folds of the drapery as unfunctional, as helplessly chiseled, as ever European art sank to in its darkest ages.” So that is a very damning point of view vis-à-vis this sculpture. But again I think a case can be made. But I’d like to say here today that I don’t think the same–I want to underscore–that I don’t think the same case can be made for architecture. 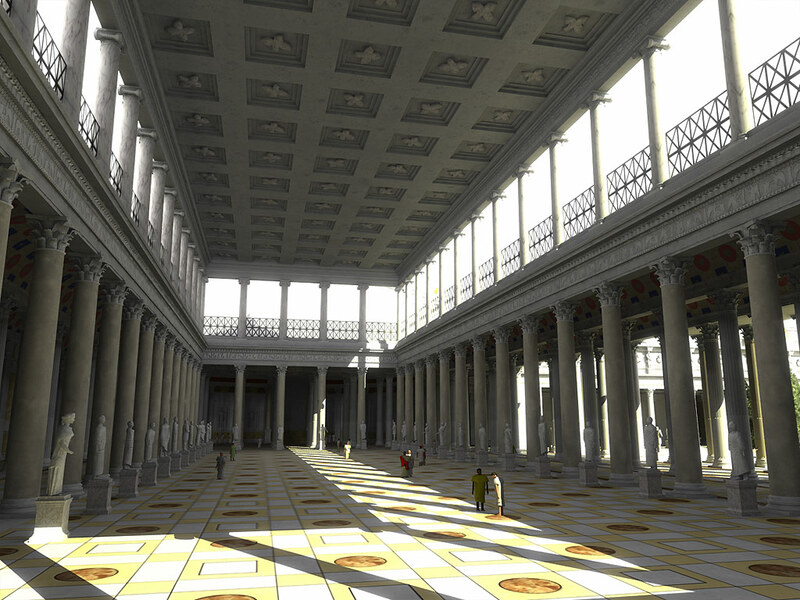 When you look at the buildings that we looked at today, the Basilica at the Palace of Constantius Chlorus, finished by Constantine, I think you will agree with me that this is a great building, and a great building again rooted in the past, looking to the future. 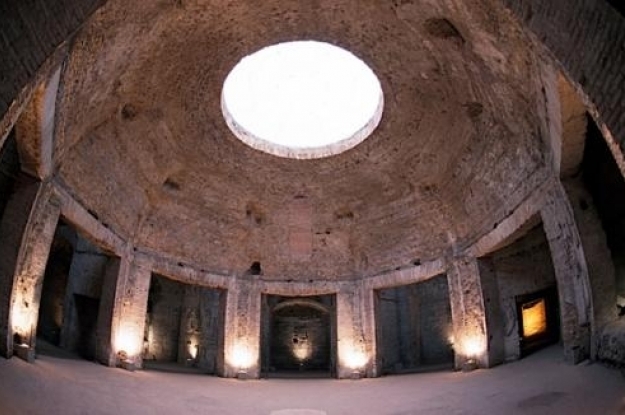 When you look at something like the Tor de’Schiavi, a tomb that is based on the Pantheon in Rome, but has the innovation of the porthole windows that we talked about — architects still innovating, still looking to the past but still innovating. The plans of the great Baths of Diocletian and of Constantine, that we looked at today. Huge baths in the imperial tradition. Not very different from the Baths of Trajan or the Baths of Caracalla; still as great. They could still build at this scale, and they continued to innovate, exploring new forms for the caldarium in each of these cases. The Minerva Medica that we talked about today. 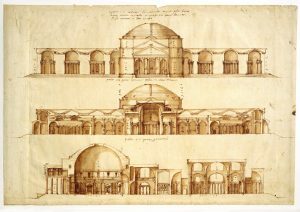 Yes, in the tradition of round buildings, in traditions of the explorations of Hadrian at his villa, or Rabirius on the Palatine Hill, but of a grand scale and with new innovations: the placement of those windows, those round-headed windows, at the base of the dome rather than the oculus, the use of a decagonal plan. Innovative, new, things that haven’t happened before. So they are looking to the past. They are building as well as they usually build, and they are continuing to add new things. 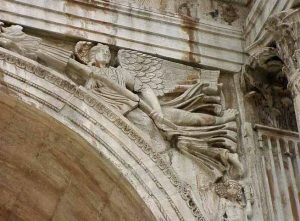 When we look at–in fact, I’m reminded, as I think about this, of the two roundels that were put up–that were added to the Arch–that were put up in the–that were made in the Constantinian period for the Arch of Constantine. And I show them to you here. 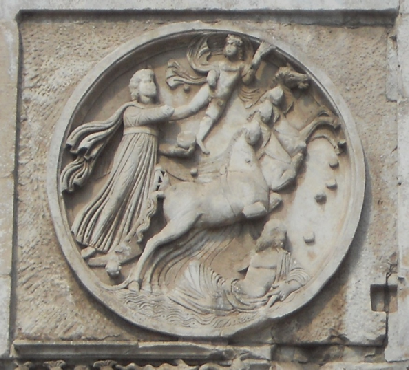 Luna in her chariot; the moon descending, a cupid by her side, and the personification of the ocean, Oceanus down below. Luna descending. And on the other side Apollo, the sun god, ascending, from the ocean, his chariot is going up toward the sky. The cupid leads the way with a torch. Just as the moon descends and the sun rises, civilizations end, eras end, and other civilizations come to take their place. 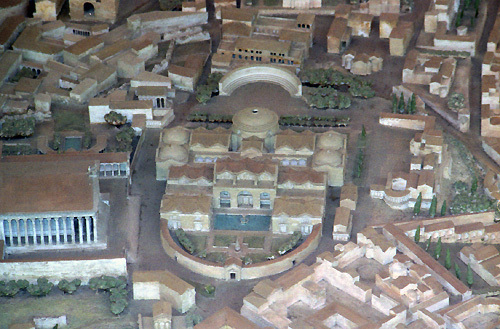 And what happened at the very end of ancient Rome is that Constantine founds a new capital. 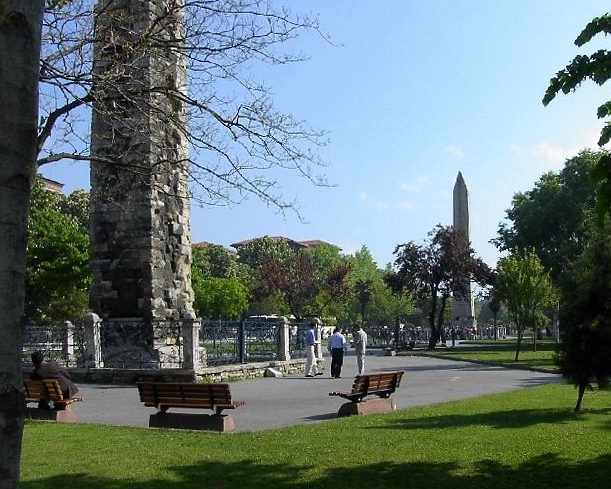 He founds the city of Constantinople as the capital of the Roman Empire. He does that in 324 A.D., and he dedicates it as the–he dedicates this new city of Constantinople to the god of the Christians on the 11th of May in 330 A.D.; 330 A.D. 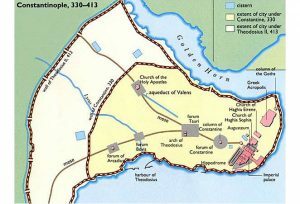 So Constantinople becomes the new capital, replaces Rome as the capital of the Roman Empire. This may not have sounded so amazing at the start, because we’ve already seen the Tetrarchs creating all kinds of new capitals; the creation of a new capital wasn’t that bizarre at this particular point in time. 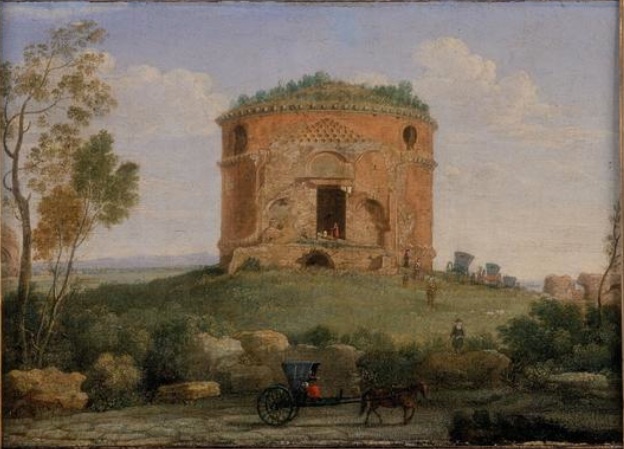 But he went on to decorate it with all kinds of buildings that look very much like those in Rome, and in retrospect we know that that move of the capital from Rome to Constantinople signaled the death of Rome, at that particular point in time, not to be resuscitated again until essentially the Renaissance. If we look at some of the buildings that survive though from Constantinople, we will see that they are based so very closely on those of Rome: the Hippodrome; the sculpture at the base of the obelisk; the aqueducts of Constantinople; and of course especially the famous mosque of Hagia Sophia, which would have been inconceivable without the architectural innovations of the Pantheon. So although we see that the capital shifts from Rome to Constantinople, that Rome’s history at this point lies in the future, when it’s going to be revived in the Renaissance; it’s going to be looked at again in the Baroque period and into the time of Mussolini and even today, when Roman architecture remains so influential. But although again the argument can be made that sculpture and painting decline, I think that architecture did not. And the lessons that the Roman architects provided have lasted the test of time, that they were passed on, these architectural wonders were passed on to the Middle Ages in the West, to Byzantium in the eastern part of the Empire; that they continued to be operative in the Renaissance, in the Baroque period, in the time of Mussolini, in the time of Richard Meier, indeed today. And I believe that they will continue to be significant for anyone designing buildings. They will provide an inspiration for at least the next 2762 years.